Challenging the 2 degree target | Climate Etc. The ultimate objective of this Convention and any related legal instruments that the Conference of the Parties may adopt is to achieve, in accordance with the relevant provisions of the Convention, stabilization of greenhouse gas concentrations in the atmosphere at a level that would prevent dangerous anthropogenic interference with the climate system. Where does ‘2 degrees’ come from? At the 2009 UN Climate Change Conference in Copenhagen, international negotiators agreed to the following: Humanity must not let the planet get hotter, on average, than 2 degrees Celsius above preindustrial levels. 2 degrees has been the focal point of international agreements and negotiations ever since. In 2009 Michael Mann published an opinion piece in PNAS Defining dangerous anthropogenic interference, which describes the burning embers diagram and the logic that went into the 2 degree determination. Since , two nasty political problems have emerged. First, the goal is effectively unachievable. Owing to continued failures to mitigate emissions globally, rising emissions are on track to blow through this limit eventually. Because it sounds firm and concerns future warming, the 2 °C target has allowed politicians to pretend that they are organizing for action when, in fact, most have done little. Pretending that they are chasing this unattainable goal has also allowed governments to ignore the need for massive adaptation to climate change. Second, the 2 °C goal is impractical. It is related only probabilistically to emissions and policies, so it does not tell particular governments and people what to do. A single index of climate-change risk would be wonderful. Such a thing, however, cannot exist. Instead, a set of indicators is needed to gauge the varied stresses that humans are placing on the climate system and their possible impacts. The best indicator has been there all along: the concentrations of CO2 and the other greenhouse gases. A global goal for average concentrations in 2030 or 2050 must be agreed on and translated into specific emissions and policy efforts, updated periodically, so that individual governments can see clearly how their actions add up to global outcomes. Policy-makers should also track ocean heat content and high-latitude temperature. Because energy stored in the deep oceans will be released over decades or centuries, ocean heat content is a good proxy for the long-term risk to future generations and planetary-scale ecology. High-latitude temperatures, because they are so sensitive to shifts in climate and they drive many tangible harms, are also useful to include in the planetary vital signs. The window of opportunity for improving goal-setting is open. This autumn, a big push on climate policy begins — with the aim of crafting a new global agreement by late 2015 at the UNFCCC’s Conference of the Parties in Paris. Getting serious about climate change requires wrangling about the cost of emissions goals, sharing the burdens and drawing up international funding mechanisms. But diplomats must move beyond the 2 °C goal. Scientists must help them to understand why, and what should replace it. However the underlying agreement is that ‘urgent action is needed to reduce anthropogenic greenhouse gases’; the disagreement is on how to sell this politically. David Victor responds at length at DotEarth, definitely worth reading. For the moment, lets accept the premise that 2C (post industrial warming) is a useful danger threshold. When can we expect to reach 2C? According to climate model projections with the RCP8.5 scenario, we would reach 2C around 2040. However, if you consider a Transient Climate Response of 1.3C (e.g. 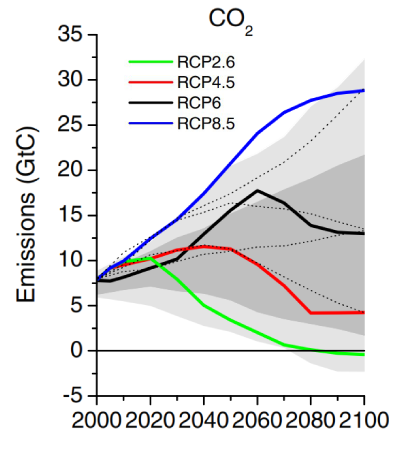 Lewis/Curry), then you would not reach the 2C threshold in the 21st century for any of the scenarios except RCP8.5. It seems we are on track for RCP8.5 for CO2 emissions, and RCP6.0 for the other gases. So we would just be reaching 2C at the end of the 21st century. And the ‘pause’ is slowing all this down by at least a decade or two. So in context of the current UN framework, personally I prefer to keep 2C for now as a policy target. There is simple political reality: the pause, combined with lower sensitivity estimates, are acting to ‘kill the cause’, i.e. urgent action needed to reduce emissions. Ross McKitrick has a new paper where he makes similar points Climate Policy Implications of the Hiatus in Global Warming. Hence scientists who are urging action are looking for another metric that looks more seriously damaging than the pausing global surface temperature. Well CO2 is the one metric that unambiguously is going up and will keep going up; the only problem is that its difficult to care about all this if the CO2 is not changing the climate adversely in regions where people live. Using deep ocean heating (a few hundredths of a degree C in the last half century, inferred from climate models) seems fairly ludicrous; if we are indeed sequestering heat in the deep ocean, well that seems to be a pretty benign place for it. Developing some metric based on extreme weather events is thwarted by the inconvenient truth that there is no detection of an increase in most types of extreme weather events and it is extremely difficult to attribute any change to humans, given the dominant influence of natural variability on extreme events. Here’s why I don’t like the 2C metric, and it has little to do with the issues raised by Victor and Kennel. The 2C metric is relevant only for the so-called linear model of decision making. Even if we had some understanding and agreement on what state of the global climate was regarded as dangerous, and we knew what to expect from natural climate variability in the 21st century (e.g. solar, volcanoes, ocean circulations), there is very substantial uncertainty in climate sensitivity to increased CO2, and hence the appropriate emissions target to avoid this level of warming. While the methods continue to be refined to determine sensitivity, none fully account for natural internal variability or for unforced ‘climate shifts’. Can we make good decisions under ignorance? A more realistic vulnerability based approach that is regional and tied to extreme weather events (whether or not they are exacerbated by human emitted greenhouse gases) is more likely to secure the common interests in each region and reduce the devastating impacts of these events on economic development. No or low regrets energy policies such as conservation and efficiency, research into new technologies, and implementations of other energy policies with ancillary benefits also make sense under conditions of deep uncertainty. Dare we hope for the UN to move away from emissions targets and loss and damage mechanisms towards more more robust policies that reduce vulnerability in the short term, support economic development goals, and work towards cleaner energy in the long term? This entry was posted in Climate change impacts, Policy. Bookmark the permalink. Warmer is better. Best would be for the planet to warm back up to the temperature of the Holocene Optimum. More CO2 is better for plants. A ppm of 1000 for CO2 would be optimal for plants and harmless to animals. Heh, StevieMac ponders the Holocene. Enjoy global warming while it lasts (not much longer). Global sea ice has been increasing for several years. Lake superior is 3C colder than last year at this time. But, but … Uh wait … The planet has a fever! Better put it in quarantine before it infects the other planets. – Factor A causes problem X (believe me). – It is worthless to measure X to see how is the problem doing. – It is much better if we measure only A, and you keep being convinced it will cause X. Or Y; or Z; whatever. I would do the same thing all the time, if I only could. Good move. good analysis. The logic of all this is mind boggling. The policy is set in stone; the challenge is how to frame/cherry pick the science to motivate political action. ‘framing/cherry-picking’ is the hubritic step. Nemesis is how easy it is to blow up the resultant science. But yeah, Stalingrad comes to mind. Judith, I like the outrage. Keep it coming. The policy is set in stone; the challenge is how to frame/cherry pick the science to motivate political action. Isn’t that pretty much the antithesis of what science-based policy advising is supposed to accomplish? Science should (ideally) be useful for evaluating different policy options and giving some guidance about the inevitable trade-offs inherent in any decision. Instead, what we are seeing is science being used to justify previously-chosen policy. If the science changes, then the justification may change, but the underlying policy does not. Science is essentially being exploited as just another sales tool. the challenge is how to frame/cherry pick the science to motivate political action. And to loudly deny that the problem isn’t solving itself without their political agenda. SLR would be a nice single metric because it encapsulates the energy budget more or less. but if comparing observations to projections was bad with temperature…. Agree with pokerguy. The hubris needs to be exposed and quashed by those with the credentials to challeng the consensuse. All well and good Dr. Curry, care to explain or describe the unique ideology behind the policy??? That concession is essential to climate debate. The public that doesn’t know the motive deserved more. The political establishment behind the doctrine should be exposed. Those countries that are not blessed with cheap domestic energy supplies clearly want those countries that are blessed with cheap domestic energy supplies to voluntarily disadvantage themselves. Alternatively, they want a want to impose tariffs on imported energy that would otherwise violate free trade agreements. Western Europe/Japan need the ‘climate change issue’ if they ever hope to end their dependency on Russian natural gas/coal. In both cases, you have to look at more than a single technology, and have to allow for short-term market variations. I know rooftop solar, especially suburban residential, is what most people think when they think solar, but my perspective is chosen for its applicability to the whole problem. When I talk about solar, I’m talking from a perspective of global, centralized distribution. Where solar energy collectors can be put in appropriate places (tropics where cloud cover is light), the energy converted to gas/oil, and fed into an already mature world-wide storage and distribution system whence it reaches semi-localized power stations, dedicated generating capacity for appropriate industries, and non-electrical applications such as heating, vehicle fuel, etc. Yet all these facts taken together give lie to the claim that solar power is mature and competitive. If 25 years are needed to break even, cells that fail in 2.5 years, or even cells that degrade faster than planned, mean solar will never be economically viable. 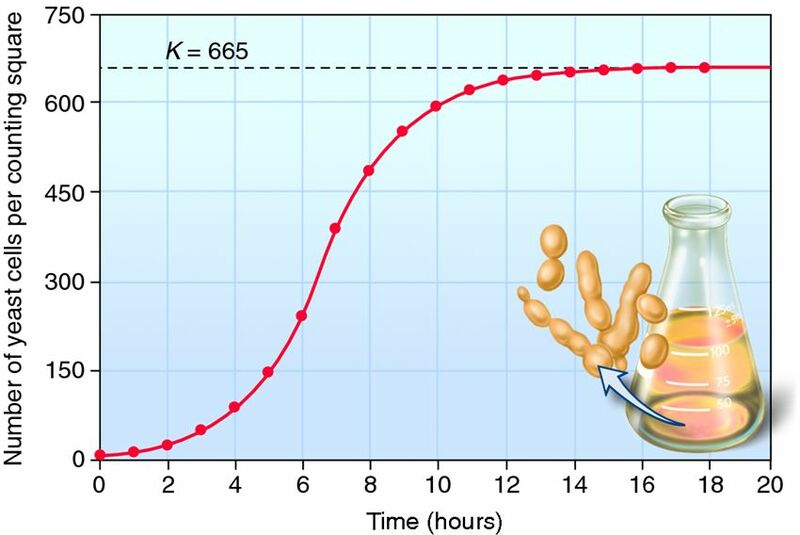 It’s effectively exponential during the early growth phase, but tapers off as food runs out, poisons (e.g. alcohol) accumulate, or both. While the analogy is highly suspect, we might suppose that “maturity” would correspond to the middle-right part of the curve, where things are more constant due to competition, commoditization, and market saturation. Thus, given the immaturity of solar PV at the moment, statements such as “solar will never be economically viable” are absurd. Ridiculous nonsense. AK – I’m not “against” solar. I am neutral on it. What I object to is the government subsidies for it. The only energy source I would want subsidized is nuclear. It is a known quantity, can supply energy 24/7, and can last for hundreds or even thousands of year when managed properly. We should be pushing it now at least as an interim solution until some of these other technologies become affordable. You are correct of course. The above has been patently obvious since the progressives burst on the scene with ‘The science is settled! We have to take coordinated, world wide action to eliminate the use of fossil fuels immediately or the extinction of the biosphere is unavoidable!’, 20 odd years ago. That has ALWAYS been their modus operandi: decide on a political activity that they want to see enacted, then identify an existential threat for which the desired political action is the only viable solution. ‘Climate Change (nee ‘Global Warming’) is only the latest and most lucrative, in power aggrandizing and money laundering (Solyndra, ad infinitum), of a whole succession of ‘We gotta act right now or we are doomed!’ problems that were ‘thwarted’ by enacting policies long dear to the progressives, but with no chance of passing through normal political give and take. AK, I have had a really tough day and then I saw you graph. Thank you for giving me the best laugh I have had in a long time. You should change your name to Vercoe. Yep. Fails the ‘So What?’ test. There’s a pool for who will still be a rabid global warming alarmist when we reach minus 2 degrees C. from here. Anyone heard from lollywot lately? Could it be that even he’s grown sick of denying the pause? Since the “rabid” part is treatable (they have shots for that), it is possible to make them “global warming alarmists”. Does that still count? I’m not sure the rest of it is treatable. That is the entire global warming bull$#!^ machine summarized quite concisely. It has never been about saving the planet. The 2C goal was considered wonderful when it served as a justification for telling people what to do. The problem with the 2C goal is that all indications are now that it can be achieved without telling people what to do. Hence, it must be ditched, in favor of some other made-up doomsday criterion that restores our justification for telling people what to do. *EVERYONE* appreciates *THIS* fundamental conservative principle eh Climate Etc readers? We didn’t let the Tobacco Racket give our children cancer, did we? Good on `yah, foresighted science-respecting conservatives! When afoMd talks about the children’s children, who’s children is he talking about? Many have died as a result of botched operations, while others have been left bleeding and in agony. A number of pregnant women selected for sterilisation suffered miscarriages and lost their babies. Sleep easy, afoMd, your environmental pogrom on poor, uneducated folk of colour is well underway. More rhetoric from the man who thinks he can do better than the Enlightenment with all of its freedom of speech, economic liberty, freedom of thought nonsense that only gets in the way of what needs to be done, Eh FOMD? By the way, I saved a link for you about those Swiss socialists. LOL … medical professionals appreciate that the healthcare system that the Swiss just enthusiastically voted to retain is a tuned-up version of Clinton/Romney/Obamacare. The day that the Swiss call upon US Republicans for healthcare advice, then faux-conservatism will have a point! That will happen roughly upon … the day the Earth stops warming. *EVERYONE* appreciates — young voters especially! — the conjoined scientific, economic, and moral bankruptcy of market-fundamentalist faux-conservatism, eh Climate Etc readers? Fan, Ask yourself ‘when did I last fill up my tank?’. Get yourself a Rickshaw and come back to us full finger wagging. Impotent slogan-shouting from faux-conservative market-fundamentalists … science-positive civic discourse by FOMD! 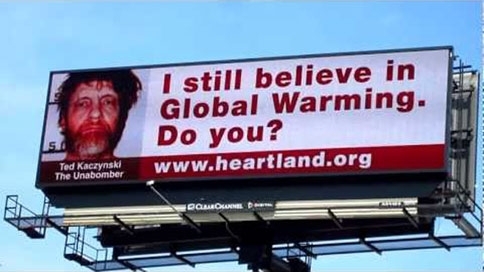 … and the unrepentant Heartland Institute slogan-shouters will decline his benediction, eh Climate Etc readers? *EVERYONE* appreciates the difference between these worldviews! So your Tesla runs on carbon free sources of electricity? It is funny how FOMD uses such polarizing rhetoric. Tell you hat fan – build your Tesla without fossil fuels and get back to me when you have a working auto. It’s always symptomatic when Dr Curry touches near basic truth about the motivated reasoning behind the AGW political meme a board freakout as displayed in this case by Fanboy is close to follow as a distraction. Dr Curry is a few sentences from the endgame of conceding “why” the climate policy was always set in stone before the first research paper for the IPCC was ever produced. That’s when Joshua, angry Michael and Fanboy self immolate on the blog. Years of tap dancing around the elephant in room come to an end and the real “reform” conversation begins. Dr Curry of course becomes a Holocaust Denier or worse is considered a GOP member by the actual “consensus” that has orchestrated the “policy” observed as being set in stone. The public admission seems close at hand. I just hope Dr Curry isn’t waiting for the GOP itself to ascend to power before fessing up to what Dr Lindzen acknowledged over 25 years ago, it was always motivated by political agenda with very little hard science backing the claim. You may remember the little hubbub a couple of years ago when a senior EPA official resigned after a videotape of a presentation he made showed him talking about “crucifying” oil and gas companies. A 1°C goal is probably attainable no change in current practices but there isn’t much evidence of harm from such a small increase. Climate Etc readers would benefit from knowing the source(s) of your understanding, Alexander Biggs. Especially valuable would be verbatim, in-context quotations from scientific article authored by Michael Mann. I did not mean that Conservatives are generally stupid; I meant that stupid people are generally Conservative. I believe that is so obviously and universally admitted a principle that I hardly think any gentleman will deny it, and I do not see why honorable gentlemen should feel that position is at all offensive to them. In other news Next-generation gravimetry satellites are showing thoughtful citizens — all around the world and ever-more-clearly — the melting of the world’s polar ice. Hopefully this will allay the skepticism of gravimetry by Climate Etc regulars (AK especially)! Conclusion Continued climate-change skepticism would be … “illogically fascinating“, eh Climate Etc readers? Economic question Are we content to drown the low-lying capitals and nations of the world, in service of cheap carbon energy? Further questions Is the short-sighted faux-conservative answer a wise answer? Is it a moral answer? In the long-run, is it a logical answer? “The Antarctic ice sheet is one of the two polar ice caps of the Earth. It covers about 98% of the Antarctic continent and is the largest single mass of ice on Earth. It covers an area of almost 14 million square km (5.4 million sq. miles) and contains 26.5 million cubic km of ice (6.36 million cubic miles). That is, approximately 61 percent of all fresh water on the Earth is held in the Antarctic ice sheet, an amount equivalent to 70 m of water in the world’s oceans. In East Antarctica, the ice sheet rests on a major land mass, but in West Antarctica the bed can extend to more than 2,500 m below sea level. Much of the land in this area would be seabed if the ice sheet were not there. This sees to be on a par with a few hundredths of a degree of temperature increase (supposedly) in the deep ocean. Why did you redact the first sentence, tonyB? Was that a conscious choice? Or an unconscious choice? The world wonders … `cuz either way, it’s an interesting choice! Gosh, could all that cold, fresh glacial water be causing the observed growth in the surrounding Antarctic float-ice? I quoted the current total. I didn’t want to embarrass you by pointing out it covered only three years. Three years!! Good luck on convincing me that we have an instrumentation system in place that can measure the total volume of Antarctic ice, over multiple year time frames, with +/- .0005% precision. For fan: As soon as you get that done, you can start work on convincing me that ACO2 is the proximate cause of the ‘observed’ changes, that these changes represent an existential threat that can be thwarted only by implementing a coordinated, worldwide, governmental ‘climate change policy’, and that the policies being demanded, which seem to consist of having the government assign ‘carbon signatures’ to essentially every human activity and then taxing and/or regulating those activities, would have any measurable impact on the climate experienced by me, my children, my grandchildren, OR my great-grandchildren. Followed by an explanation of why the climate established by four generations of government control of energy production and consumption is ‘better’ than the climate that my descendants would experience if the government just ignored the climate entirely. I look forward to fans replies to your questions but I think he is already very busy trying to explain why he is so concerned about an alleged three year ice Melt period but does not believe the18 years temperature pause is significant. Or perhaps , like Ben Santer he DOES think it is significant? Since 360 km^3 represents 1 mm of sea level, we can expect this flood to raise the level of the sea by about 1mm every three years. Meaning that if I wade out into the ocean up to my lips and stand there for a century or so, the water will cover my nose and I will drown. On second thought, maybe it IS time to panic. TonyB, what’s interesting about Greenland/Antarctic ice-flow is that — unlike ocean-currents and land-weather and human-record-keeping — ice-flow is *not* dynamically turbulent (and I will mention that heat-flow in boreholes also is not dynamically turbulent). So when satellites see sustained and/or accelerating Greenland/Antarctic ice-mass loss — along with sustained and/or accelerating ocean-heating and sea-level rise — that’s a whole bunch of mighty strong, global-scale, non-pausing, non-turbulent evidence that James Hansen’s energy-balance climate-change worldview is scientifically right. *EVERYONE* appreciates *THIS* common-sense strong-science reasoning, eh TonyB? And your opinion of the 18 years pause is…? Whilst you are about it what is your opinion on the validity of boreholes?you posted a link a couple of weeks ago which I was much taken with, although just because it shows the upwards temperature trend since 1700 that I have endorsed several times doesn’t necessarily make it right. So, are you now an endorser or denier of the value of boreholes? It’s simple: the less noisy/more global the data-channel, the more plainly it shows us there is no pause. That’s what pretty much *ALL* climate-scientists think, eh Climate Etc readers? The met office refer to the pause, so why won ‘t you? When I was there late last year two senior scientists also discussed the pause with me. Pointing to sea level rise doesn’t alter the fact does it? Mind you, as it has been warming for 300 years it’s perhaps not surprising that the sea levels edge gently upwards. Except in politics, that is! As you can see from the links the official position of the met office is to acknowledge the link. Scientists working for the met office that I spoke to are going to acknowledge the official position. Why do you deny the pause but point to a psltry three year blink of an eye as regards ice? Why do you provide me with a link to US politicians who deny climate change? 97 percent of UK politicians are signed up to the legally binding climate change act which is forcing the UK to cut its emissions. For fan and a few other alarmist hold-outs, it’s the interruption that dares not speak its name. This statement is obviously incorrect for 3 reasons. 1. The handle of the hockey stick is horizontal. 2. The blade of the hockey stick (assuming he meant blade) isn’t vertical. 180-135 = 55°. While a 55° upward slope is steep it would not be considered vertical. 3. The proportional length of Mann’s blade falls within the 25 to 40 cm. long considered normal for a hockey stick. It can be argued that Mann was drawing the full blade and not making a prediction of future growth. Since the “blade” has not increased vertically since the Mann paper this interpretation can be defended. The precautionary principle means that one should not stray far from success, and into the unknown; the default Conservative system is that things are working OK and can be improved in an evolutionary, not revolutionary manner. History shows us plainly that the “default Conservative system” works reasonably well … right up to the moment that it doesn’t any more. That’s why the Founders’ radical ideals remain viable, and why the radical inquiries of “the Troll of Rome” carry great weight. *THAT* is obvious to *ALL* citizens, eh DocMartyn? Yeah, revolutionaries have been presenting rationalizations as to why they should be put in charge forever. It almost never works out as well as the American Revolution did, but this is the one revolution you seek to undermine FOMD. And your bigoted belief that conservatives are mostly stupid says more about you than it does about conservatives. You want to know something about bigotry? Expressing it doesn’t make the bigot feel low and mean, it makes the bigot fell elevated, with a little added frisson of superiority. You should think about how writing smears about large groups of people makes you feel, and why you do it, in a serious way, FOMD. If stupid people are generally conservative, why is it so hard for the liberals here to answer simple questions about Mann’s work. It sort of looks like there are plenty of stupid liberal people. The presumption of liberal (leftist) intellectual superiority is essential to rationalizing totalitarian inclinations. Cuba, Soviet doctrine or the arrogant MSM lecturing the unwashed for generations. Fanboy doesn’t have reasoned or influential arguments so he self rationalizes by insulting those who question. It is the progressives absolute conviction in their moral and intellectual superiority that makes them virtually unreachable. As a recovering liberal myself, I can tell you that it’s a philosophic prison from which its very difficult to escape. Not many do. Of course conservatives don’t generally change their stripes either, but I think it’s instructive that when someone does change their poltical orientation, it’s generally in the direction of conservatism. I can’t prove that, but it seems correct to me…in just the way people don’t generally change their opinion on “climate change” in the direction of alarmism, but rather the other way. The way the climateers prosecute their climate war, brilliantly plays into this progressive mindset. That they won’t debate skeptics strikes liberal believers as just right. So too does the likening of global warming skeptics with holocaust deniers. This is not…and never has been about the science. This is all fine and good, but the MWP sea level was the equivalent of 17″-20″ higher than today. 1. How did all that water warm/ice melt without modern CO2? 2. How can it be claimed modern temperatures are unusual? I’m not sure why you bring me up particularly in terms of “skepticism of gravimetry”, IIRC the only thing I’ve ever said about it was that such measurements are very recent and can’t be used to allocate sea-level rises to melting ice vs deep ocean heat prior to the very late 20th century. But I will point out that every mm of sea-level rise attributed to “melting” ice is a mm that can’t be attributed to deep ocean heating. And, given that it takes almost two orders of magnitude less heat to raise the sea level by melting ice than by warming the ocean, more melting ice means less support for any “global warming” energy balance model that depends on the deep ocean for the “missing heat”. AK, please allow me to acknowledge my mistake and apologize unconditionally for it! It is It was “angech” (not AK) who denies the technical feasibility of observing ice-mass loss by gravimetry. Thank you for pointing-out this mistake, AK! I think everyone would be benefited by being reminded of everything Pielke Pere has written. Thank Gaia he’s got an accessible blog. Thank even higher powers I can’t comment there. When reality strikes, and the GMT pause is just one example of reality but also no hurricanes landing on US soil in 7 years or the lowest US tornado occurrence recorded this year, it is time to stop what you are doing. Stop supporting flawed GCM output, take a deep breath and consider starting from scratch; i.e. following what the data says and not what the UN agenda told you to follow; i.e., find how humans are causing climate change. Marginalizing the 2 C argument is a first step. Lapsing into the flawed “more extreme events” story would also seem unwise (with a warmer world we have a more homogeneous temperature from equator to poles and less temperature differences means decreases weather energies). Incorporating mitigation strategies in a climate plan may help. But, the most important effort should be aimed at achieving global population wealth by making energy cheap, abundant and available to everyone. The current crop of renewable energy systems are not fit for purpose nor likely be cost-effective for the near future. Transition fossil fuels and modular nuclear are a reasonable solution for the 21st Century. Decreased equatorial/polar temperature vs increased energy in the system. I admire that they are countervailing. Using CO2 as a metric for “planetary health” is just stupid. Sometimes, that’s all you can say and is accurate. I think it’s fine as a metric, but why did they get the gauge upside down? What’s closed forever it seems, is the alarmist mind. Greasy palms of course, remain wide open..
PG, this is called the “assumption close”……”would like the car in red or black Mrs. Jones? ?” Turns out Mrs. Jones doesn’t want the car at all and has learned to dislike the salesperson rather quickly. Each pile of IPCC rubbish comes with a built in presumption that emissions are impacting global temperature and there is simply no actual science proof to back that. We have “expert” opinions from a tiny close ranked climate consensus academic industry with every possible financial and social/political self segregation and disposition to support the warming-emissions meme. The time is long past, list their names, their political affiliations, financial conflicts and research funding sources. We register and regulate numerous industry associates exactly in this way. All conflicts with potential “advice” from this community should be treated the same way. An organized disclosure of the conflicts would greatly change the public debate. It’s a stealthy partisan consensus being the key failing. Is it fair to also say that this analysis is subject to the following caveats? 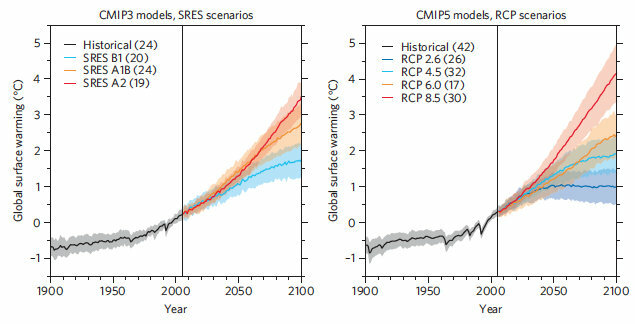 IPCC4: A temperature rise of about 0.2 °C per decade is projected for the next two decades for all SRES scenarios. So far, only 0.3 °C off. Not bad; off 0.3C of 0.3C a score of zero. About sums up the capability of the IPCC AR4. Define “soon”. Give us a date. And, while you’re at it, define “forever”. Its already too late, CO2 levels will likely continue to rise for decades to come. If you believe the models are ready for policy, then the heat is already baked into the pipeline for this century… gonna happen. Start getting your arms around > 2C warming and adapting for that reality. Quit whining about lost opportunities already lost. If one can believe the UN’s copious “output” documents (a somewhat dubious prospect at best, I agree!) over the past two years, they obviously don’t give a damn what “the science says”. They seem to be far more concerned with “financial mechanisms” of the “innovative” kind than anything else! The ever-changing verbiage (with the possible exception of “transformative” which seems to have taken quite a firm root) strongly suggests that regardless of what the “science” says, it is merely a crutch for more money to be turned over to one or more of the ever-increasing stable of “funds” for their redistribution. I think it’s really important that we view climate change as a problem in managing risk and not as a political issue or an environmental issue. It’s a risk issue. The science is really clear on climate change, and there are <real opportunities to be forward-looking in the area of adaptation and the area of mitigation. My sense is that what we really lack on the international scene is an appreciation of where the opportunities are to be smart and effective and ambitious. In some ways it’s a gap in leadership, and in other ways, I think it’s really just people not getting their arms around the essence of the problem and the opportunities for making progress. Meanwhile, yet another UNEP affiliated organization (with a self-declared 10 year lifespan) has been growing by leaps and bounds. FutureEarth – yet another creation, courtesy of (former IPCC Chair) Bob Watson, a nice smiling guy, who seems to have his hand in many UNEP approved pies. Sources and more details at IPCC’s new narrative and Future Earth, new kid on the “transformational” block. Perhaps someone needs to talk to Ki-Moon’s speechwriter, and tell him to get with the program, eh?! Another thing I’ve noticed in UN generated verbiage is that “climate change” and “sustainable development” are getting closer and closer together. So, the view from here, so to speak, is that the next big scare (which they’ve been working on generating for quite a few years now), i.e. “biodiversity”, fits the “sustainable development” mantras – and can quite easily incorporate if not painlessly assimilate “climate change” and all its uncertainties will be swept away via a cleansing tide of the even more amorphous “biodiversity” kind! Some time ago I would have put my money on ocean acidification. But with average surface air temperatures going south there will not be much hope for yet another metric that can be measured to some degree. Today I’d be betting with you on biodiversity. It can’t be measured, except by agenda-laden experts, and it brings the added bonus of lots of cute, cuddly animals in dire need of saving. Yeah, it’ll be biodiversity bolstered with Animal Rights. No more weekend fishing for the proles – those carp need trauma counselling you know. I put my money on water. We’ll tell you how much, when and how you can use water. Worse than that. The WWF released it’s Living Planet 2014 report. It focused on abundance of high profile species – something that is well defined and relatively easy to observe. There are problems from which the obsession with carbon dioxide is a distraction. Not much room left fer wilderness and wild life. grasses, pond weed and plants like (require) CO2. The problem becomes how to separate real issues of resource management from slogans in transformative agendas. One way is to see how they respond to proposed solutions that don’t impact the economy. If they start calling people “deniers”, it’s a clear sign. Dr C. We are not on track for RCP8.5 emissions if we consider it shows a peak oil production rate circa 175 mmbopd in the 2070’s. If you compare the RCP8.5 oil production curve with Exxon Mobil’s projection through 2040 (that’s as far as they go), you can see a large difference. Exxon’s curve is layered and includes an NGL component which isn’t really oil nor is it fed for refining. Once we strip away the NGLs we can see their projection is lower than mine through 2034. Where I differ from EM is their use of significant volumes of crude from very expensive sources. Implicit in Exxon’s estimate is a significant hike in real oil prices, which are needed to sustain production beyond the 2030’s. Such increases aren’t very coherent with a fast growing economy and world population as assumed by rcp8.5. only South Asia and Africa as potential increasers. Though they may develop tastes for air conditioning, fortunately neither needs much heating in winter. Because of the logarthmic relationship, constant rates of annual emission will lead to slowing rates of warming. Lucifer that chart is really interesting. I approach it from the supply side. We are having a really hard time finding crude oil at today’s prices (this explains why Shell tried to drill in the Chukchi Sea and Exxon Mobil shows it may be drilling in the Laptev in the future). Not too long ago I prepared an emissions forecast and I couldn’t get it to go beyond around 630 ppm. Lately I have been reading through Exxon Mobil material and I found some really interesting trends. ExxonMobil crude oil production has been declining. I would expect it to increase a bit in the next two to three years but after that it looks grim. They have very good returns, they are well managed, gave lots of cash but they seem to be moving on eggshells. I get the feeling they decided to shrink into a smaller but very high return company for the long run. This fits with the thesis that long term we are running out of good places to look for oil. By the way, I also noticed the methane curve. Most climate experts treat methane as a second thought. It’s used by the IPCC folk to trick up their emissions to pump up the forcings. I don’t follow the oil industry, but I did note that Jim Chanos said he was shorting some oil companies because the recovery costs were increasing thus squeezing margins, which fits your thesis. The demand side is significant, though. US, Japan, and most of Europe are aging rapidly. For one thing, this means slower growth ( greater percentage of the population is living on fixed income ). For another thing, old farts, after they take that dream trip and also visit the grand kids, come back home and don’t travel much. Efficiency is also at work, but the overall pattern is clear – the more economically advanced a country is, the more likely their CO2 emissions are declining. So, paradoxically, the best way to reduce global emissions is to foster African development with fossil energy! I suspect the main limitation on investments in oil production is the geopolitical risk involved in the places that haven’t been as thoroughly explored and exploited yet. It’s sensible to go from cheaper to more expensive sources, and the more-stable political regimes represent a cost advantage sufficient to allow more-exotic geology to be exploited there. Even if you found a field where the oil was practically bubbling out of the ground, you’d hesitate to invest if it were located in the Congo. Global oil prices extended a months-long rout into bear market territory on Friday, with Brent notching a new 27-month low as the dollar spiked following upbeat U.S. employment data and further signs of undiminished crude supply. Geopolitical tensions in the Middle East, eastern Europe and Asia have failed to prevent a slide in the oil price over the summer. Although Islamic State insurgents have advanced across northern Iraq, this has had little impact on oil production in the south to date. Some analysts say that only a cut in output by the Organization of the Petroleum Exporting Countries (OPEC) will rescue oil prices. Although some OPEC countries are calling for supply cuts, other core members are betting that winter demand will revive the market, suggesting the group is no closer to any collective steps. You aren’t suggesting we “rescue” oil prices are you? That is about as useful as EMS “rescuing” healthy people walking down the sidewalk. PA, some commodity analysts give a high probability of West Texas Intermediate falling to $85 within a year or so. We are awash in crude in the US. Here, it’s not hard to find it at this price. In fact, some oil shale producers could continue to make money if WTI fell to $60, but that price isn’t being predicted. On the natural gas side, two major factors come into play. The first is the colder climate of late. The colder Winter last year caused higher than normal consumption of NG. Likewise, the cooler Summer caused lower than normal consumption. The net of this is that storage was drawn down during the Winter, and more than otherwise possible was stored during the Summer, which brings us to the second factor. NG pipelines haven’t been completed in the NG shale plays, so that gas can’t get to storage. As a result, storage has not been replenished from the draw down of the Winter. If we have another cold Winter, NG prices will rise. PA, no I’m not suggesting any kind of market manipulation on the part of the US government. The Saudi’s are the wild card here. They usually increase production during times of lower oil prices in order to keep the same amount of money flowing to them. They use oil money to pacify their citizens and thus maintain order, so the odds are they will increase production. This will cause oil prices to fall further. PA – here’s good article on softening crude prices. U.S. oil boom has changed the oil market. Oil prices have seen sharp drops over the last few weeks, with no visibility as far as how low they will go. In this week’s column, The Commodity Investor examines the demand/supply dynamic to determine where prices are heading in the fourth quarter and beyond. Brent prices have been in a downward spiral since the summer months of June and July, when benchmark prices reached a high of $115 per barrel. Since then, prices have dropped to $95 per barrel, representing one of the sharpest declines in the last three years. Earlier this year, Brent prices were trading within a tight range of $105 to $110 per barrel price band. This leads us to the supply-side of the equation: Supply from OPEC as a bloc has been increasing. Saudi Arabia is running at close to 10 million barrels per day, which is putting a big strain on prices. In addition, countries such as Libya that once produced 200,000 barrels per day have now increased their production to close to 800,000 barrels per day. As far as WTI is concerned, it really is a North American and American domestic story. The US has pretty much become self-sufficient in terms of oil—that dream of energy independence has never been as reachable as it is right now. Consider the following: In 2004, the United States imported close to 60 percent of its oil needs; today it imports less than 3 percent of its oil. The shale oil revolution has really transformed the landscape in the United States. However, unlike its Brent counterpart, WTI seems to have stabilized within a $90 to $95 price range. Historically, WTI has always traded at a discount to Brent, and the situation is no different now. I expect WTI will keep trading at a discount to Brent for the foreseeable future. Steve Postrel: Congo´s oil has been exploited for a long time. I worked there in the 1980´s, during the heydays of the Angolan civil war. The local population, and even the Brazza based CIA agents were quite confused when they heard there was a Cuban in Pointe Noire working for a multinational. Congo´s oil tends to be divided into two major provinces..one is a post sal section which tends to have heavier oils, and a presalt section with lighter oils. Seismic data aquisition under the salt can be quite dicey, which means there could be some oil hiding under the salt. However, Congo is child´s play compared to other places we consider. Right now the craziest places I know of are northern Iraq and the Kara Sea. But we are running out of crazy places to look for anyway. We’re never going to stop importing oil because supply diversity is prudent. Both oil and natural gas production in this country are the highest in about 35 years. There is an enormous demand for rig crews, frack crews and all the associated equipment and materials. Horizontal drilling and fracking have opened new opportunities for investing in domestic energy, whether for pure-play explorers in developing shales, producers in mature areas, or service companies opening up the monster wells. Oil and Gas Investor Editor-in-Chief Leslie Haines has been following the revolution for nine years, and agreed to share with readers of The Energy Report the names of some beneficiaries of new technology’s multiplier effect. Leslie Haines: I have been covering shale development since 2005, and it looks like we are on track for energy independence by 2020 or so. However, we’re never going to stop importing oil because supply diversity is prudent. Depletion rates are significant in every shale play. Some of the depletion rates are quite steep in the early years of a play, but wells tend to produce for 20 years or so at a lower rate, so overall production rates are still growing. LH: When we say monster well, we are referring to an above-average initial flow. We’re seeing this happen in the Utica play in West Virginia and southern Ohio. Some very large dry-gas wells are being reported with initial flows of 20-25 million cubic feet of gas a day [20-25 MMcf/d]. That’s a huge gas well by anybody’s measure. In one basin, you may find the number of formations that can be tapped is quite numerous. In the Permian Basin of West Texas, for example, more than 5,000 vertical feet of pay can be tapped. If you sink three horizontal legs into that well, three different horizons can be fracked and produce from one well. It triples the effect of that well and acreage. We are seeing such an incredible surge in supply of both oil and gas that producers, analysts and investors are starting to get a little bit worried. We had very high natural gas prices a few years ago, and then the surge of new production, combined with a mild winter, made the price of natural gas go right back down. At one point, natural gas was below $4/Mcf. It’s come back a little this year, but there is still quite a bit of concern. LH: Companies like Cabot Oil & Gas Corp. (NYSE:COG), Range Resources Corp. (NYSE:RRC), Chesapeake Energy Corp. (NYSE:CHK) and EQT Corp. (EQT:NYSE) are doing quite well in the Marcellus. The same thing is true in the Bakken, the Eagle Ford and the Permian Basin. Some 20 companies may drill a play, but a handful do most of the work. And they are the bigger companies. Historic oil prices have averaged 23.18 in 2014 dollars. Not going to see that price again. Given a significant amount of US wells have a full loaded extraction cost in the mid $50 range there is a bottom. Any comment on US refinery match with available supplies? The claim that US refineries are mismatched to new US supplies is being used to justify export (actually exchange) of oil supplies. The argument sounds good on the surface. While the major refineries in the US spent oodles of money to gear up for heavy crude, the situation is now in flux. It will eventually pay to gear up for light crude. A four-decade ban on most exports of U.S. crude prevents the oil from reaching overseas markets, which is keeping domestic supplies higher and prices lower than international benchmarks. Refiners are allowed to export the fuel and other materials they make from oil, so they now benefit from international market prices for products they make with cheaper domestic crude. The shift has kicked off a push to retool Gulf Coast refineries to deal with the kinds of oil now flowing through the pipes – typically a lighter grade than imported crude that requires different refining capabilities. The volume of inbound crude eventually may test the area’s storage capacity, although analysts say that isn’t happening yet. Hey, Lucifer, I love one of your reflections on the demand side. Here’s demand-side progress for you. Two generations ago I think the Old Farts saw their kids across the US border from Quebec a total of twice. One generation ago the Old Farts visiting the kids meant an 8-hour trip across the US plains in a V-8 powered Chevy once every 2 years. Today the Old Farts rack up something like 25k miles a year in their Dodge pickup (hemi, I believe, since diesel, methane and LPG are still mostly missing Stateside) shuttling among the continental clan. Add to that two roundtrips of 12 hours once or twice a year winging to Europe to see the rest of the grandkids and you have a good picture of where progress has brought us. By the way, the current generation of Old Farts is happily taking advantage of the US’ modern medical system, so they plan on continuing this way pretty much forever. I believe my great-grandparents would have called all of this a Miracle. It’s hard to fathom the modern misanthropes’ reaction of horror in the face of such riches. ISo, paradoxically, the best way to reduce global emissions is to foster African development with fossil energy! You think that developing nations should use fossil fuels at the same rate as Americans and you also think that this will reduce emissions? When in the future will this miracle occur? Sorry about the formatting, but the block quote should be on the first paragraph. What is surprising to me is the lack of interest in precipitation. Floods and droughts are important to most people. A few degrees of temperature change are less important. We have centuries of records of river heights and good rainfall records for recent years, yet the climate discussion seems to ignore this elephant in the room. More CO2 makes plants more drought resistant (and more ozone resistant). Plants at higher CO2 maintain growth during dry years. That’s a partial solution, given that potable water is becoming an issue in many parts of the world, like California. Can’t help you with the flood thing. However floods and droughts much worse that what we have today occurred before the 20th century. It is called weather and is something that people have to adapt to. The claims that CO2 makes weather worse on average don’t seem to pan out. PA, drought has always been an issue in many parts of the world. People don’t build huge dams in areas where the water supply is reliably plentiful. Revkin has a post on this in which he links to Ramsdorf’s and Romm’s critiques, and includes a long reply from Victor. Getting serious about goals requires working across disciplines—especially between the natural sciences and the social sciences, which are about human behavior (which is what, ultimately, these goals are trying to change). The failure to do that effectively is one of the reasons why climate science hasn’t been more directly linked to policy. And that is precisely why we are working as a team across disciplines and why I have devoted a whole career reading and working at the frontier of multiple disciplines. Here is what I e-mailed to Victor on October 1.
was very much needed. We need this discussion. Moving beyond the 2C issue, the effect of all of the human radiative forcings (which are not just CO2 and a few greenhouse gases) on atmospheric and ocean circulations also needs to be understood. It is these climate features, rather than a global average temperature, that results in floods, droughts, ect. McAlpine, C.A., J.G. Ryan, L. Seabrook, S. Thomas, P.J. Dargusch, J.I. Syktus, R.A. Pielke Sr. A.E. Etter, P.M. Fearnside, and W.F. Laurance, 2010: More than CO2: A broader picture for managing climate change and variability to avoid ecosystem collapse. Current Opinion in Environmental Sustainability, 2:334-336, DOI10.1016/j.cosust.2010.10.001. Pielke Sr., R.A., R. Wilby, D. Niyogi, F. Hossain, K. Dairaku, J. Adegoke, G. Kallos, T. Seastedt, and K. Suding, 2012: Dealing with complexity and extreme events using a bottom-up, resource-based vulnerability perspective. Extreme Events and Natural Hazards: The Complexity Perspective Geophysical Monograph Series 196 © 2012. American Geophysical Union. All Rights Reserved. 10.1029/2011GM001086. I hope this information is useful. Please share with Professor Kennel as I could not find his e-mail. Thanks for all the interesting reference materials. Whenever you contribute here you have a host of good information to share. I read two books, Mesoscale meterological modeling and Human Impacts on weather and Climate. I remain grateful for your courage and rationale discussions in the midst of the climate controversy. Plus all the information you can provide. I think climate science fails to connect to policy because climate scientists never come up to the engineers’ floors. Instead, they go visit the social scientists in the basement, thinking their location next to the large printers will come in handy when they start printing reams of studies and brochures about global warming. His biggest problem is that he takes “Joe and Stefan” seriously. They’re attack dogs, don’t even understand the science, just want to spout arm-waving BS in support of their position. 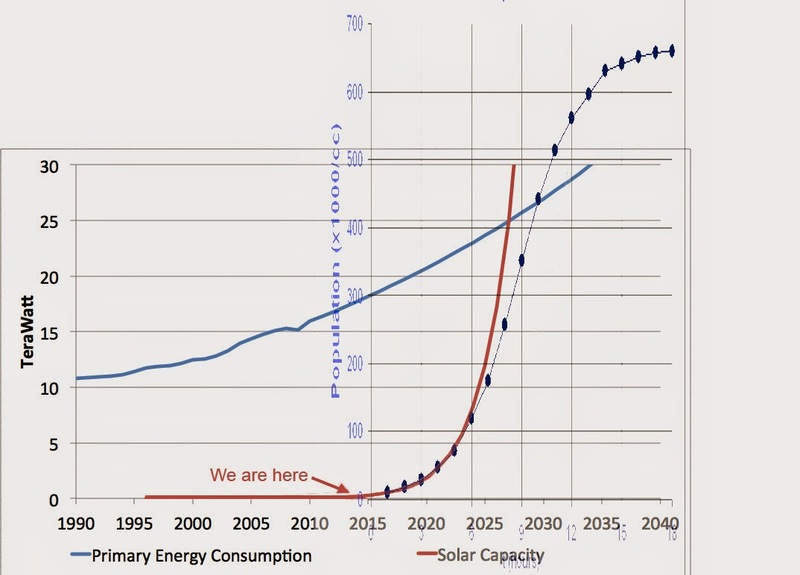 Considering that transient climate sensitivity is low,that equilibrium sensitivity has a relaxation time of centuries, that the Bern model is overly pessimistic about sink saturation, that the RCP8.5 scenario is overly pessimistic about innovation progress., then we must conclude that we have 70 years to develop cheap alternative energy. The lack of mention of nuclear power struck me. The coupling of coastal cities to reverse-osmosis water supplies, supplied by inland nuclear power stations, would allow water resources to be used for watering plants. “Yet, in the real world, there are zero BECCS plants in existence today and no sane firm is planning any serious investment in the technology because of the terrifying costs and regulatory risks. A few years ago the models loved a CCS technology fired with coal, but in the real world coal CCS has barely taken off as well. If you restrict CCS then the models love nuclear power, but in the real world there are limits on nuclear. Some models love renewables; others don’t. Honestly, I think there should be a simple metric: pCO2. Recent work suggests that (pseudo-)linear climate responses aren’t likely to be a problem before technological improvements solve it without help. There are certainly risks from non-linear responses, but there’s no real way to gauge the actual climate risk, and there are other risks besides climate. So pick a goal for pCO2 that looks reachable within our expectations of technology, without any serious impact to the roll-out of a Western-style lifestyle to the rest of the world, then put together a plan for that. I like sea level rate of change. If it hits 5 cm by 2023 give me a holler. The sea level during the Mid-evil warming period was 5″-8″ higher than today. From this it can reasonably be concluded that when current temperatures reach those of the Mid-evil Warming Period the sea level will be 5″-8″ higher. However If we adjust for GIA (the 0.4mm per year sinking of the sea floor) that the sea level adjusters use to justify adding 0.3mm to the annual sea level, they were effectively 5″-8″ + 0.4 meters higher than today,proving the MWP was much warmer. 5″-8″ + 0.4 meters is almost 2 feet. Well, you’re in luck. There is already an organization for you: 350.org. Unlike those misguided fools who think that holding the global temp to a 2C rise is scientifically meaningful and politically achievable, 350.org knows that if pCO2 is allowed to go over 350ppm, we are all TRULY doomed. Unlike 2C, which we might pass and apparently even flourish under, 350 ppm CO2 has been identified by no less a scientist than the inestimable James Hansen as the scientifically established line in the sand that we must not cross. So, send them as much of your money as you can, and they will keep pCO2 below the 350ppm tipping point level. If they don’t succeed, we will all surely die! Most of the world lives in a manner reflecting the fact that for them energy is a scarce commodity. In the West many people on the Left don’t appreciate the fact that the culture they rail against is what allows them to take energy for granted. A better way of thinking about the dangers of climate change is the RATE at which we are approaching something that could be judged to be catastrophe. Sometimes thinking about the number of years of “non-catastrophe” left helps. A consensus on a definition for “non-catastrophe is unlikely, but arbitrary choices illuminate the situation. Given that climate is often minimally defined by a 30-year period, let’s consider the rates over the past 30 years. The current rate of temperature rise is about 0.14 degC/decade. That gives us about 70 years before temperature rises another 1 degC. (No one should care how things compare with pre-industrial!) Some people think the next 1 degC of warming could even be net beneficial. Other than SLR, warming in the polar regions is mostly beneficial to man, so the warming rate outside the polar regions (perhaps 1 degC/decade) may be more relevant if we also track SLR. If the rate of warming accelerates, we will know that +1 degC is coming sooner (consistent with the IPCC’s central estimates). This approach violates the “precautionary principle”. Developing countries, the less affluent in developed countries, and leaders who wish to remain in office (especially when their economies are struggling) can’t always afford the precautionary principle. The precautionary principle suggests that we should double employment taxes for Medicare and (given the worldwide risen in extremists/terrorist) and double spending on defense. AND if sea level rise is in fact a function of emissions. The current controversy centers around how the contending factions treat the above proposition. To be accepted as a legitimate ‘Climate Scientist’, it must be treated as an axiom. For skeptics, it is a theory, with little to no observational data to support it. Sea level rise can be a problem. It definitely reacts to a warmer climate. And if it keeps rising then things aren’t working out very well. Most of it will be caused by a warmer climate. It’s inescapable. Can’t get around it. Medieval Warming Period 5″-8″ higher sea level than today. All of the GMSL sites add 0.3 mm for GIA to the sea level per year (despite the NOAA claim). Sea floor is sinking 0.3mm per year. Using 0.3mm x 1000 years for the GIA offset (I used 0.4 before in the thread) the sea floor was 11.8 inches (that’s almost a foot) higher than today. The MWP temperature driven sea level was effectively 17″-20″ higher than today. Further – the current level rise started in the late 1700’s. 1. Some/Most/All of the sea level rise is natural and we aren’t going to stop the natural rise. 2. MWP was much warmer than today (up to 20″ of sea level warmer)..
To be honest, nothing anyone here says is going to dent the public perception that this whole subject is dishonest. And because it is perceived as dishonest, people are not going to commit to any targets. Mother Nature knows well — and citizen-scientists know too — how to dent perceptions. “– Factor A causes problem X (believe me). 25 years of world carbon(sic) taxes, where is the evidence it stops climate change? Or makes weather less extreme? The ‘pause’? Less fires, tornados or hurricanes? Polar ice not completely melting? The problem for the climate alarmist at this point if they want to claim this data as evidence of taxes working, is the 400ppm carbon(sic) and rising. The limit of 2 C is reached in only 25 decades. Judith: You had a posting earlier that showed that RCP 8.5 was not realistic. It burned more coal than there were reserves. My back of the envelope calculations how the same. A previous poster here also shows a similar result. Judith: While the near term looks like RCP 8.5, the longer term trajectory (say 2100) is not possible. If the lower sensitivity you use is correct, then we will never see 2 deg of warming, regardless of the RCP used, as we will have run out of fossil fuels long before. The argument “is 2 deg C dangerous?” becomes moot. Yes, I think that is right. there is need to develop alternatives to fossil fuels, because they will gradually become more scarce and expensive. Nuclear is an obvious near term alternative, but it remains vigorously opposed by most of the same people who demand draconian fossil fuel reductions. The biggest long term problems are unlikely to be caused by rapid warming; transitioning away from fossil fuels will be the far bigger problem. The climate concerned only get in the way of the most economically viable alternative. I think it would be better to start transitioning now, so we don’t have to worry about the cost and supply issues in the future and we are able to mitigate against the worst potential impacts of climate change in the process. I also mentioned in a previous post that we already have other reasons to move away from fossil fuels including health effects. Hans: Yes, but as Dave Rutledge shows, full coal reserves have never been fully used. They are left in the ground. But the world economy will look like a frog crushed by a steam roller if it has to pay the cost to move those resources to the customer’s tank. My observation is that we get a lot of spreadsheets and theory but nobody can tell me where to get the oil. I should add that I spent years trying to figure out the optimum way Venezuela could produce its giant oil reserves. What I found wasn’t what many of you hear. And my knowledge base is worldwide. RCP 8.5 isn’t feasible. I forgot: exploration is increasingly expensive. Ask Shell how much they have spent trying to drill in the Chukchi. Or what it costs per well to drill at Perdido in the Gulf of Mexico. Or inquire from ENI what happened to them at Kashagan? Well, the problem is that the scenarios use a linear approximation. This works with guns as well for near targets. For distant targets (and 2100) a ballistic trajectory has to be used. Claiming that CO2 levels can be driven above about 620 PPM requires a false analysis. The 21st century annual CO2 atmospheric increase (per Mauna Loa) is linear but the annual emissions (mostly driven by China) are increasing at a higher rate. Further only about 40% of the emissions are staying in the atmosphere. And that is directly from the IPCC Tar and Feather document. The amount of fossil fuel needed to support a linear increase in CO2 to about 620 ppm by 2100 becomes impossibly large hence the linear rate of CO2 increase will decline.. 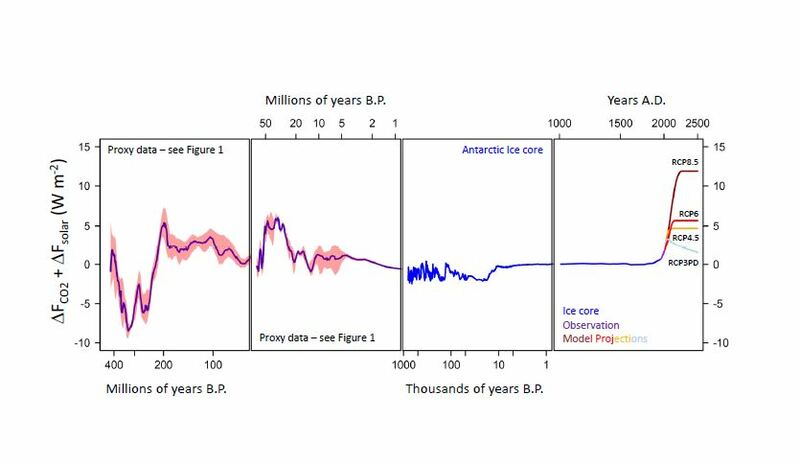 It occurs to me that the graph you provided above represents a plot of the position of the ‘Knob That Controls the Thermostat of the Earth’ and, if we can believe what we are told, the thermostat has been turned toward ‘hotter’ monotonically, at an increasing rate, since we began logging its position. While the knob on the thermostat was being ‘cranked up’, the actual temperature experienced prolonged periods during which it in fact increased. There were also periods during which the temperature went down, and other periods (like the most recent 15-20 years) when it didn’t do anything noticeable. Now I don’t know much about ‘knobs controlling the temperature of the Earth’, but if I had a knob on my stereo that behaved the same way, I would think seriously about checking whether its set screw was firmly tightened. > … full coal reserves have never been fully used. They are left in the ground. There are a lot of coal fires and these reserves will be 100% exploited, just not by man. A further point on Chinese coal, “100 to 200 million tons more can be considered as lost resources due to the hazards attached to their extraction”. Another thought I have about your post is that we are either going to need to reduce our rate of fossil fuel use in the medium term term or we are going to run low on supply (especially oil). How do you envision a reduction or flattening of demand when we have rapidly growing developing nations like China and India with large populations in poverty? I think as populations increase and the developed world continues to develop that we are going to see an increase in demand for energy. How are we going to meet this demand without no carbon technologies? preciseness from using fi gures should be avoided when discussing global stabilisation goals as they may be misleading. Talking about a 2°C target to be achieved with very high probability does not mean that it should be distinguished from a 2.1° or 1.9° target. It is however, for example, certainly different to a 1°C or 3°C global temperature change. Each of the corresponding trajectories characterises qualitatively different risk portfolios related to climate impacts, adaptation and mitigation efforts, given current best available knowledge. There is very high probability that the climate system has much broader limits of uncertainty implied here. It includes – more likely than not the persistence of non-warming – or even cooling – for decades. And the next climate shift is sure to surprise. But leaving aside what the science of dynamical complexity suggests – the difference between the sides is deeply embedded cultural norms. It is the difference between top down control – with targets and control of economies and societies – and the polycentric approach as espoused by Elinor Ostrom and which is likely to be much more effective in a multi objective and multi-gas strategy. Denial is not typically about science – of even the wildly unlikely variety – but of preserving the fruits of (classic) liberal enlightenment. We need to change the dynamic of the discourse – away from unrealistic goals, catastrophic scenarios and overweening ambitions to transform economies and societies – to pragmatic bottom up approaches to multi-gas strategies, energy innovation and humane development policy. King Warming is dead. A tiny number of his more obviously embarrassing ministers will be expelled from the palace. Long live his nephew, King Volatility! He will redouble our efforts to fight the boogie-men with new herds of white elephants! Better targeted precision tackling of, er, you know, stuff! Policies to be crafted by crafty new ministers who really know their craft! The people shall be brought along with new metrics and fresh buzz-words! There shall be jet trails to Paris, limos from CDG! And, of course, there will be communication. Oh, how you shall be communicated with, my pretties! The problem with fossil fuels is that all of their external costs (e.g. health effects) are not taken into account. We also have to realize that they are finite resources that will only increase in cost in the future(some at faster rates than others). And even if we accept there is deep uncertainty about the effects of CO2 on climate change and directly on the oceans, there is still a risk of extremely adverse impacts. So in order to account for the external costs and risks from climate change, I would support a carbon tax that was tied in some way to the total of amount of estimated yearly health related costs from the pollution. The revenues from the tax would be rebated to the consumer and invested in low carbon energy research. The details of how the tax is calculated would have to be worked out. But the important takeaway is that we are accounting for external costs and at the same time mitigating the risk of costly adverse impacts due to CO2. I think this is a fair and balanced approach that benefits almost everyone and by doing so we leave a less polluted and healthier environment to future generations. The benefits of energy availability far exceed any downside of specific energy sources. Until there are reasonable alternatives available in an open market – it is all pointless nonsense intended to deceive on the ultimate objectives of fringe extremists. Taxes are not merely unworkable and unwelcome – but unnecessary. I know – let’s vote on it. Yeah, if it weren’t energy, I’d favor a tax. Actually, a tax that increases slowly from negligible to almost punitive over, say, 40 years would probably work, if the political situation could be trusted to carry through. Which it can’t. And anyway, the alarmists are in too much of a hurry, want to start with too high a value, not really enough to make alternatives pay for themselves, but enough to raise the price of energy too much. I’m beginning to wonder if the real reason they’re in such a hurry is they want to rush their agenda through before solar with storage becomes really competitive with fossil, and makes their whole point moot. AK – the price of oil will continue to trend up, so an increasing tax really isn’t necessary. […] – the price of oil will continue to trend up, so an increasing tax really isn’t necessary. Actually, it can’t be counted on to “continue to trend up”, any more than a tax can. For different reasons though, plenty of people are investing plenty of money and effort finding ways to make it cheaper. Such as Joule, Unlimited. And have you seen what infighting goes on with the inflation index? The same would happen with “total of amount of estimated yearly health related costs from the pollution”. Which, in turn would make it unpredictable for businesses, which would tend to suppress investment. Well, there is a 1-3 trillion dollar a year benefit to burning fossil fuels for agriculture, fish, and forest. There has to be a proven “external” cost that exceeds this benefit. And solar and wind provably increase (a lot) short term pollution. To replace a 2000 MW conventional power plant requires 8000 MW of 25% available wind power. That is 800,000 tons of mostly stainless steel and 2000-3000 tons of rare earth metals (The GE 1.5s and Siemens SWT-2.3-101 turbines were used as the source for the steel estimate). Mass production of silicon based solar is just insane from a pollution standpoint..
“Sigh” but if we are going to forgo the benefits of fossil fuels there is an alternative. A modern nuclear plant is much cheaper per MW, produces dependable base-band usable power, and doesn’t require as much pollution to build as other clean power sources. Nukes get the Jim Hansen seal of approval, but the mindset of the green movement is such that countries like Germany would prefer to fund Vlad the Impaler. It is irrational. there is still a risk of extremely adverse impacts. I find most of the adverse risk assumptions tend to wither under scrutiny. Which adverse risks are you concerned about? Sea level rise? 3mm per year, some of which is unrelated to warming. Most of the buildings in NY that were around 100 years ago were torn down long ago. Most of the buildings that are here now will not be here 100 years from now because they are in disrepair or obsolete. The very slow sea level rise is not a problem. Storms? Global average temperature does not determine storm frequency nor strength. That’s certainly born out by the global cyclone energy, hurricane and strong tornado counts. Drought? Drought is not cause by global average temperature. Droughts of note are from lack of precipitation which is a function of the general circulation. The drought in the SW US circa 1200 AD and the Dust Bowl were certainly during periods of lower global average temperature. Floods? This one might actually hold water ( hee-hee ). Increased water vapor means greater precipitation potential. But, you know, there’s not likely to be increased precipitation without increased floods and numerous places would benefit from increased precipitation. Most of the claims of harm are unscientific and many come from a gross ignorance of meteorology. A carbon tax along the lines of AK may be okay if it is coupled with real world solutions. Until we have workable renewables in place we may have to use nuclear. With the waste problem and accidents it has a low PR problem but if people understood the choice between CO2 emissions and use of new generation nuclear that could be overcome and be a short shelf life way to the future. If a tax penalty is all that is offered with no real solutions it will only serve as a power grab and cause economic harm. That is usually borne out by the poor not big oil. It may help big government but not the people. CAISO is the California independent systems operator, and it tallies almost all of the electricity in CA excepting Sacramento and Los Angeles. Yesterday, about 78,000 megawatt-hours of energy came from renewables, about 11% of the total 706,000 megawatt-hours of the electricity that was consumed. With the shorter days, solar provides a smaller fraction of peak demand, because demand peaks from 5p – 7p while the sun is setting. Yesterday there was little energy from wind because there was little wind blowing; same is forecast for today. The lack of wind is good because the daytime temps peak at around 100, there are lots of fires, and wind would spread the fires and create firestorms. California is conducting an interesting experiment: solar farms where the peak usage is 5 – 7 hours pas the zenith; wind farms where people hope the wind won’t blow on hot days in Aug – Oct; hydropower without dams and reservoirs. California also has an initiative on the ballot for Nov 4 that, if passed, will direct money toward the enhancement of California’s flood control and irrigation network. Environmental groups are split on the issue, though most support it. I shall be interested to see whether it passes. Joseph you are mixing up the climate (green house gas effect) problem with health problems such as caused by soot. They require different approaches. Nope, I am providing a more broadly based rationale for moving away from fossil fuels. Let’s let Nancy Pelosi, congress and the president handle the details. They surly couldn’t screw up the details of anything this important, again. How any reasonably intelligent person can correlate giving more money to congress and lowering the earth’s temperature amazes me. Government spending has never fixed a problem. Additionally, how anyone can believe that making Wall Street millionaires into Wall Street billionaires will lower the earth’s temperature is more than a little strange. But, how anyone can believe that giving billions of dollars to third world murdering thug regimes to buy more weapons and power will lower earth’s temperature boggles the mind. How does a rational mind put all this together? Lewie…Cookie… Is this your work? Professor Curry: For the moment, lets accept the premise that 2C (post industrial warming) is a useful danger threshold. Why? Why not take current climate as good, and concern ourselves with a 2C increase from here? The evidence that pre-industrial climate was better than now is slim to none, and the pre-industrial climate included epochs that were warmer than what we have now, as well as cooler eras that were more hostile to life. This paper reminds me of Churchill’s famous lines: Now this is not the end. It is not even the beginning of the end, but it is, perhaps, the end of the beginning. That is an exaggeration! CO2 alarmism is not militant German National Socialism, but that is one of everyone’s favorite quotes. I don’t think he was kidding. I meant “My Churchill fave:” but this went into moderation. I wonder why? TNX. Make an effort to listen to the audio. First, stop calling the climate of the last 15 years ‘ a pause’ . The only evidence for further large increases in global average temperatures comes from the models which failed to prediict the present constant average temperature. So the models are an unreliable guide to future temperature and should be ignored. Unfortunately the UN’s FCCC has invested too much in non-performing models and so cannot abandon them. The charade will continue until the UN has the courage to admit the truth. The UN doesn’t have courage, it has a network of vested interests. The flow of money into this cabal is enormous. Many of these countries are hoping for a reparation payday from you-know-who even while they dump their share of CO2. My crystal ball is a little foggy. I’m sticking with the pause for the moment. If the temperature goes up by 2030 – the CAGW crowd have some game but probably not enough to worry about, depending on how much it goes up and how much is computer generated. If the temperature stays the same until 2030… something strange is happening, and any truth to CAGW isn’t enough to worry about. If the temperature declines by 2030 CAGW is simply wrong. Testing …now why is my recent comment in moderation? One suspects that professional politicians are used to being lied to and that they are not generally happy that the people lying to them are motivated that the thought that politicians are too dumb to understand the truth. You don’t because they shouldn’t? Surely if the missing heat/energy has gone into the ocean – with it’s far greater capacity than the atmosphere – it will be diluted. IOW energy which would warm the atmosphere by (say) 1 deg would warm the ocean by only 0.01deg (numbers illustrative). Which 0.01 deg would be all that would or could be “released” back into the atmosphere from the ocean. Generally speaking if data is presented in the wrong units there isn’t a problem. Fukushima alarmists report radioactivity releases in terms of tons of water. Radioactivity isn’t measured in tons of water. Radioactivity releases are measured in Becquerels. Ocean heating is reported in zettajoules.. Zettajoules is not a unit of temperature. Temperature change is reported in Kelvin (K) or degrees celsius (°C). It’s just what we need: a massive rebranding exercise sanctioned by Nature (the crud publication, not the real thing). Where were Victor and Kennel when they needed to sell New Coke? Excellent post, Judith. Re V&K’s “Instead, a set of indicators is needed to gauge the varied stresses that humans are placing on the climate system and their possible impacts,” I’d prefer a set of indicators which gauge the stresses placed on humans by futile attempts to micro-manage the climate. # Calling on the full fury of The Law. far-away resorts with sympathetic friends. I am sure that those indicators will be forthcoming tout suite, and trumpeted loudly by the MSM, the moment that it has been reliably ascertained that Hell has frozen over. Deep uncertainty didn’t stop numbers-man Robert McNamara. Looks like it won’t stop the IPCC. Some people just aren’t convinced till they’ve burned through a few trillion. They like something they can count. It’s true that numbers never lie….about numbers! In other works, the climate system is a massively complex, chaotic, non-linear, coupled system made up of 5 separate subsystems, each with it’s own set of complexities and each affected by the interactions of all the subsystems combined, and affected by external forcings such as the sun, polarity, gravity, cosmic rays and who knows how many unknown unknowns. The position that any single component of such a complex, chaotic system is THE control knob that will enable humans to control the climate is simply hubris on a scale that is utterly breathtaking – especially when that control knob is a a whopping .04% of the atmosphere – just one of the 5 subsystems of the entire climate system – and, human contribution of that .04% is between 3-4%. Time to wake the f up and start dealing with real problems and stop wasting precious resources on this nonsense. Personally, the Nature article is little more than yet another attempt to move goal posts and change the playing field. It’s pointless debating the science any more. It’s a lost cause. Frankly, I no longer care. The only hope we have to avoid a slide into an economic depression is to work to elect skeptics. Republicans have an excellent chance of gaining control of both Houses and ultimately winning the White House in 2016. The Tories will hold Canada. Australia has Abbott. India is offside. So is China. Come 2016 there will be no one left to keep this fantasy alive with the exception of a few diehards (Europe?) who are beyond reason. Bit by bit we will then be able to undo all the damage that has been done. Climate research budgets will be slashed. Whole departments gutted. The IPCC has two years of life left. This is now a game of politics and the scientists are children here. 1. Motorized goalposts. Victor wants to change the targets because the pause is killing the cause and his less-sophisticated cohorts don’t get it and are barraging him with friendly fire. 2. Hardworking policy volunteer and expert on political science and policy-making wants to increase the behavioral relevance of the targets to motivate action. Pie-in-the-skiers don’t grok that you can’t “hold governments accountable” for things like global temperature that are not in each actor’s individual control. I can give a Wal-Mart cashier company stock options but that won’t motivate him much because nothing he does will have a perceptible impact on the stock price. I can hold the cashier accountable for smiling, not making mistakes, rapid processing, etc., much as one could hold national governments accountable for national CO2 emissions. 3. Victor’s attackers are afflicted with the equivalent of a certain Austrian corporal’s notorious unwillingness to allow retreat from indefensible positions. Victor urges immediate withdrawal from the Stalingrad of 2 degrees Celsius and is met with the equivalent of a “not one inch, fight to the last man, my secret carbon-capture wonder weapons will win the war if you just hold on” message. He tries to explain that the wonder weapons are vaporware and that he is about to be overrun by hordes of growth-demanding Chinese with their squadrons of conventional coal plants. I couldn’t agree more, and this is exactly what is happening whether the remaining skeptics like it or not. The important target for policy is of course CO2. That is a direct and easily measured metric where it is also possible to translate fossil fuel reduction actions or not into consequences. Depending completely on policy, by 2100 we could have a stabilized 450 ppm level, or a rising 750 ppm level. CO2 can also be put into a paleo context. The last time it was 500 ppm was 35 million years ago, the time before the Antarctic had a permanent glacier because it was too warm for polar ice, and sea levels were 70 meters higher. That won’t happen immediately but that would be the trajectory as we exceed 500 ppm. The higher latitudes and land warm much faster than the global average rate, so a 2 C global average is actually higher in most developed countries which are at those latitudes. The article also makes a lot of sense in proposing tracking metrics like 3-sigma deviations. This will show the shifting temperature distribution in various localities in real time, and rainfall statistics will also change. But it isn’t “the skeptics” who particularly don’t like the CO2 targets. It’s Romm and Rahmsdorf and the U.N., all of whom cling to the two degree target as if they were shipwreck survivors and it were the only log in sight. And I don’t see any evidence that they are going to lose out to Victor in the continuing climate follies. They transition between 2 C and 450 ppm interchangeably. 2 C is easier for the public to comprehend than 450 ppm, but 450 ppm is easier for policymakers to relate to in terms of targets. Both have their uses. The public are capable of comprehending complex concepts. A CO2 target is just as simplistic as a temperature target. The real madness is the failure to conceptualize that the higher the CO2 signal, the better the biome. That’s plausibly true of the temperature, too. And it seems man is unable to much manipulate either. Oh, well; back to chaos and millennial scale variations which dwarf our puny contributions. Someone’s kicked sand all over my Charle’s Atlas. Meh, ‘level’, not ‘signal’. Got sensitivity on the methyl xanthine deprived neurons. No, Jim D, the alarmists do not “transition interchangeably.” That’s why Victor is having to remove all those arrows from his back over at dot.earth. stevepostrel, it is just a misunderstanding between them. Victor doesn’t know that the temperature is used as a metric for risk. You can’t use CO2 concentration as a metric for risk. He wants a metric for policy, probably implicitly recognizing that the risk is tied closely to CO2 level. They are talking past each other. I thought methane was a green house gas and it’s a lot worse than CO2…and I’m not sure comparing today’s climate to the climate 35 million years ago is correct. The geography and prior history weren’t the same. Methane and other GHGs even minus aerosols add 25% to the forcing change from CO2 alone, so yes these others are important. The forcing is currently changing about 0.5 W/m2 per decade, and CO2 accounts for 0.4 W/m2 of it. Paleoclimate forcing changes were comparable with where we are headed. This is quite instructive. From the same Victor item For your information he completely dismisses using CO2 at 2 degrees as a goal and yet you turn his complete and utter negation into support. Clearly they are talking at cross purposes. Romm and Rahmsdorf talk about 2 C because that relates more closely to risk, while Victor talks about CO2 concentration because that relates more closely to policy. Both are right to emphasize depending on the purpose. Great grounds run through the same filter. It is difficult to imagine that climate is at all predictable against a backdrop of vigorous natural variability – and it is not as if the rate of warming is all that striking. I am inclined to take the high point of the early century warming – 1944 – as a starting point and the late century high point – 1998 – as the finish. This accounts for both a multi-decadal cooling and warming period. Surely – there is an obvious rationale there. We may even assume that all of the warming between 1994 and 1998 was anthropogenic – unlikely as that is – to give a warming rate of 0.07 C/decade. Well short of 2 degrees C anytime soon – especially as the oceans are contributing to surface cooling for decades seemingly. I am inclined to just move on entirely. There are plenty of things to be getting on with. Trade, development, progress and conservation. It seems rational to move away from 30-year-old crude metrics for climate change as our understanding and measurement technology improves. Yes, the 2C line in the sand was political, not scientific. So what? It was probably bad politics as well as being non-scientific. So what? The people who brought it forward were probably doing the best they could at the time. Let’s thank them and move on. A new approach would allow us to take into consideration Dr. Pielke Sr.’s well-placed concerns about other impacts we have on our climate (and the rest of our environment). For it should be true that the amount of carbon we can afford to release into the atmosphere is a variable, not a constant. If we clean up black carbon, reforest instead of deforest (am I the only one who thinks of F Troop when I see that word?) and do a better job of soil management, then perhaps we can allow ourselves more emissions. If we fail on those metrics then we may have to be more stringent. 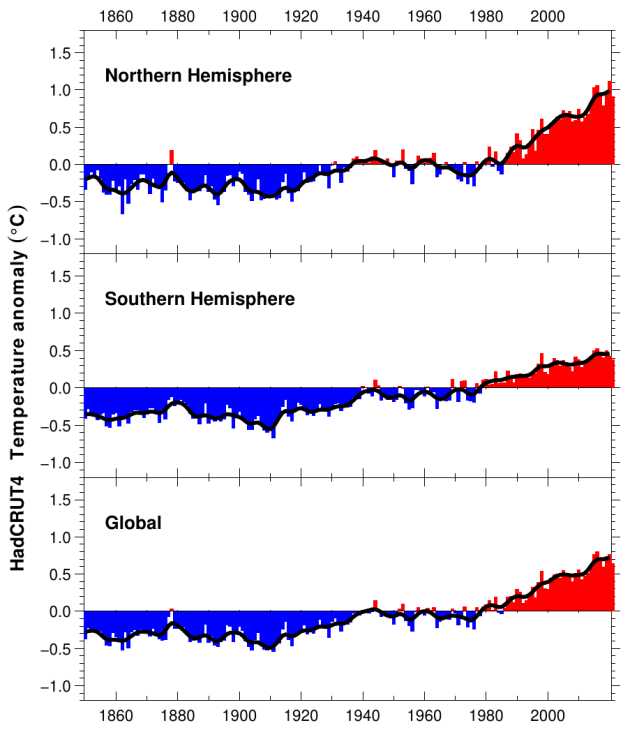 Global average surface temperatures should not be in and of themselves a target. Increasing droughts, precipitation and extreme weather (none of which have evidenced themselves to date, with sincere apologies to California for my seeming lack of concern) should be. Our ability to feed the planet should be. Our success in saving threatened species should be. Sea level rise should be. This doesn’t mean that we should abandon concern about that portion of climate change caused by our emissions of CO2. It means that we have to add that concern into a larger mix of concerns–to integrate our efforts to lower emissions into a portfolio of solutions that address other environmental concerns. It’s time for the climate tail to quit wagging the environmental dog. The discourse is just far too irrational to countenance. It is largely narratives of catastrophe linked to overweening ambitions to transform society and economies. A milleniailist psychopathology based on a contrived synthesis they delusionally call science. At 0.07 degrees C/decade – getting some rational perspective first might be a better idea. Bob, Tom and others. Firstly I am not talking about anything whatsoever to do with Bernoulli equations: I am obviously (I would have thought) using Kinetic Theory and discussing the same kinetic energy which does indeed determine temperature, and the very real gravitational potential energy which varies with altitude. What I have written is correct physics and you will never prove it wrong. It would be better if you genuinely tried to understand it. Several engineers and physicists are now starting to agree with me because they can understand it. The problem is in your understanding, not the physics. See this comment if it doesn’t get deleted. I’m composing the billet doux, Tom. I’m stuck on how to word my thanks. I’ve a feeling of being moved on from there; let it be as the gentle rain. ROB: yourb graphs show an important point that so far has been little discussed.\: They clearly show that the northern hemisphere is hotter than the southern. I believe that historically more people are too cold in the northern hemisphere, so any global warming will benefit more people in the N hemisphere. Am I right? Question: Am I right that the RCP8.5 scenario doesn’t have a temperature feedback? Are the adverse effects of warming on GDP incorporated in the emissions (poor countries emit less CO2)? The RCP forcing files only contain atmospheric GHG gas concentrations, flourinated gas concentrations, and ozone depleting substance concentrations. There are commentorial fields on GHG emissions and Kyoto GHG emissions. The simulations can do whatever they like with the information. 2. Where did you get the idea that poor countries are carbon neutral or negative and advanced countries are carbon positive? That isn’t supported by and large. The biggest net polluter (China) is a relatively poor country. The countries burning down rainforests are horrible CO2 “polluters”. 3. Where did you get the idea that warming is adverse to GDP? There isn’t a lot of support for that either. Well Richard Tol and the ipcc both state that warming above 1.5 degrees is detrimental to gdp, yet i don’t see that negative feedback showing up in the rcp 8.5 scenario. The RCP8.5 scenario is a stupid-world one where despite growing temperatures, the people never connect it to their continuing growth of fossil fuel use. It is kind of like the current situation but extended into even more ignoring of the growing evidence that something is wrong. More of an impossibly stupid world, which screws up the chance of having a meaningful discussion. A zero Carbon scenario in 20 years is also an impossibly stupid world, though it is more likely than RCP8.5. All it would take is a few retro viruses and a global conflict or two. RCP4.5 or 6.0 are “likely” more indicative of BAU and a 50 to 75 year transition to some lower/minimal fossil fuel dependence more “rational” if anyone can remember what that should mean. captd, no, I think in the real world the people are starting to see the error of their ways, which is smart, and this is already leading to action with only a small resistance from some not-so-smart naysayers who prefer the carbon-based growth choice. JimD, “captd, no” So you “believe” a carbon neutral world is possible in 20 years? captd, it only needs to be 50-100 years. Who is saying 20? Did you read my comment before saying no? captd, from that it looks like 20 years is your own invention. The most ambitious IPCC scenario has zero emissions around 2080. What is RCP3-PD? That would be carbon neutral by roughly 2035 to 2040.
captd, no, flat growth is not neutral. Zero emissions is. Looks like you can still be net emitting in 20 years under this scenario. JimD, My apologies, I typed carbon neutral meaning no increase not zero emissions. Since soils account for about 15 to 20% of emissions, there may never be a zero emissions future. For RCP3-PD to happen, there would have to be a large reduction in emissions, meaning Atmospheric CO2 could stop rising then decline by ~2040 which is very unlikely with around 1200 new coal plants planned in the ROW over the next 8 to 10 years. It is an unrealistic scenario. RCP4.5 and RCP6 are the most realistic. captd, however, that scenario also says that reducing emissions to 1/3 of today’s does stabilize the climate even if we don’t go to zero, so I learned something today too. Perhaps aiming initially for 10 GtCO2 per year is more politically pallatable than 0, as it allows for some countries that need more time due to limited technology. That would be RCP4.5 which is “likely” provided some of the technological breakthroughs actually happen, mainly on the transportation energy side of things. It is not only palatable, it is doable without breaking banks. RCP4.5 doesn’t have an adequate reduction rate and only stabilizes after it gets to 500 ppm, which is too high, because then Antarctica melts at a faster rate towards zero glaciers (Greenland being unstable long before 500 ppm). Still in denial I see. The Antarctic glaciers are steadily losing mass whether you like it or not. This is little commented on by skeptics. Perhaps some form of denial. I don’t know. They are losing some ice mass. Large range of uncertainty, but looks like a loss to me. However, that loss is not directly attributable to AGW, it may be circulation related, Rosby Waves or lack of accumulation. The average temperature of the Antarctic MAY have increased by 0.5 C in the past 60 years, then maybe not. It is that small a change. And the average temperature is well below -20 C degrees. Antarctic sea ice keeps making records on the plus side while you keep quoting fuzzy facts. I think skeptics need to pay more attention to both Greenland and the Antarctic. Clearly they are interested in sea ice, so this should matter too, and actually more since it directly affects future sea levels. The only trend seen in either glacial mass for the last ten years has been downwards. Hans, the IPCC decided to use a spread, with forcings previously defined using the available literature. The literature included cases which yielded forcings in the 8.5 watts per meter squared range. They chose the 8.5 as an extreme outlier. The next step was to run climate models to achieve the target forcing. The emissions were fixed to achieve the desired forcing using the accepted models. They in turn had the range of climate sensitivities they happened to obtain, which were (apparently) derived from calibrations which used the 20th century climate record as the main go by. The models have no choice but to achieve the target forcings. The emissions pathways and the other asumptions are whatever goodies they had to throw in the pot to make the whole thing have some semblance of logic. Whether the scenario has any logic at all isn´t that important, because the aim was to create a forcing range. This means the authors of the scenarios have no pride in their contents (or shouldn´t have any). The problem arises when the RCP8.5 is called “business as usual” and we see climate researchers run sensitivies off that particular case, as if it were something cast in cement. I have seen this approach in the past, and it yields a massive amount of garbage. Considering the models themselves are inexact, this is more like writing opera than science. It went way beyond science into science fiction and there´s no turning back. It’s the Works, alright, and grand; song, dance, acting, staging….and tragedy. Hans Erren, the second image you post is basically meaningless. It’s comparing different results from different types of studies with different economic baselines, time periods and growth rates. Even if they were somehow comparable despite having no way to actually align them, the regression model used to fit the data points has no validity. The type of model was chosen in an almost completely arbitrary manner, was never validated in any way, and was shown to be highly sensitive to small perturbations in the data. Even if all that weren’t true, and we could believably interpolate the data points in that way, we can’t possibly extrapolate from such a fit. That image is completely unreliable. I’d go as far as to say it is pseudoscience. I get people may like Richard Tol’s conclusions, but his work supporting them is utter dreck. It is far worse than things the WUWT crowd routinely criticizes. The only reason it is accepted by “skeptics” is they like the message. I was concentrating on the adverse effects beyond 1.5 degrees which IPCC considers likely, yet the RCP 8.5 emissions look unaffected by this heavy dent in global GDP. My point is: you can’t have it both ways. If high temperatures have a detrimental effect on GDP, then high temperatures also have a detrimental effect on emissions. Hans Erren, I’m not sure what that has to do with the figure I criticized, but I think you are a bit off-base. Harming GDP does not automatically mean emission levels will be lessened. A country’s GDP could be harmed by a course of action which raises emission levels. For a trivial example, imagine if a country decided to change its primary source of energy to some inefficient “green” source. It’s easy to see how that could reduce its GDP. At the same time, the manufacturing overhead and various problems caused by the change could result in emission levels rising (such as less power to warm houses leading to more wood burning). That said, I do agree with your point in a general sense. Economic harm will affect emission levels. Building on that, I’m not sure how you could avoid circularity in this. You use an emission scenario to as a parameter in a model to calculate the effects of global warming. You use the effects of global warming as a parameter in a model to create an emissions scenario. How do you verify either? As RCP8.5 is a SRES A2 variant, the implicit energy is a simple extrpolation of the current energy mix i.e. Predominantly fossil fuel, ( onterwise you cannot create an exponential emission growth) clearly the RCP 8.5 scenario does not consider negative climate feedbacks, because as world is warming five degrees there seems to be no economic impact in the essions, which is very comforting news. IPCC WG1 finds that high temeratures do not have any adverse effects on economic growth. Which is of course not what WG2 states. As for your questions, RCP8.5 is an emissions scenario. They do not use a temperature feedback for it. For your other question, a bunch of models are used when calculating the emission scenarios. They don’t all handle things the same way. I believe some do incorporate damages from global warming, but I’m not sure. Proponents have realised that they have failed to sell the message of dangerous global warming. No real signs of danger? So, switch the tactic. Ditch warming. Go for CO2 and other indices. Absent from the discussion, again, is proof that CO2 is doing damage. The oceans are not suffering from alkalinity change to any evident extent. Really, what is the case for other than ‘do nothing, but observe’? What I am reading is a great deal of panic that careers and incomes and cherished industries are at risk because of the lack of proof of a need to be concerned by CO2 or global warming. Is it now evident that nebulous wrong models produce nebulous non-evident threats? It is timely now for some of the main activists for alarm to lie down and rest while considering a more benign future than the self-serving one they preached. Especially HJS, the deluded architect of much of the alarm. Moderator: The physics in this statement is totally valid, as others on other climate blogs and in the sciences are starting to realise. I suggest you leave the comment intact and watch my response to any attempted rebuttals, as I can help you and your readers understand the thermodynamics of the atmosphere which I have probably studied more than any of you, and certainly understood better. The whole concept of targets is useless because we have absolutely no valid physics that can be used to prove that carbon dioxide does any warming. I have never felt comfortable in calling the radiation between, say, two parallel plates at the same temperature “standing waves” for that would necessitate the distance being an exact multiple of the wavelength. However, the effect is the same: none of the electro-magnetic radiation is converted to thermal energy assuming each is radiating with exactly the same Planck function. Basically, because each object is able to radiate the same frequencies and intensities, resonance occurs. Physically I believe this amounts to electrons being raised between energy states, but then always re-emitting an identical photon as they return to the same lower state. Without the incident radiation the object would have to first convert some of its own thermal energy into electron energy – that is, raise that same electron to the same energy level. Now, considering the Earth’s solid surface to be warmer than the region of the atmosphere from where it is receiving radiation, then the surface Planck function is higher, but it fully encloses the Planck function of the cooler source of radiation. So some of the surface radiation (corresponding to that under the Planck curve for the cooler atmosphere) just resonates – acting like the above radiation between two plates at the same temperature. However, the surplus radiation in the surface Planck function that is above the cooler Planck function does have its electromagnetic energy converted to thermal energy when absorbed in the atmosphere. But it doesn’t happen the other way. So we deduce two things: The back radiation cannot help the solar radiation to raise the temperature of the surface, so you cannot add the two fluxes and use the total in Stefan Boltzmann calculations to get the surface temperature. Only the IPCC can do that with their special fissics. Secondly, because there is no conversion to thermal energy for back radiation striking a warmer surface, there can be no direct effect on the rate of cooling by non-radiative processes. These two conclusions wipe out the radiative greenhouse conjecture totally an utterly. Now I am talking about the area between the Planck functions as representing the radiation which has its energy converted to thermal energy. However, because the Stefan-Boltzmann equation is based on the integral of the Planck function, this area between the Planck curves has exactly the same numerical value as you get when using the difference of the S-B results. That’s elementary of course. But the important thing is that what I have explained shows us how every single independent one-way passage of radiation obeys the Second Law and always transfers thermal energy only one way from the warmer source to the cooler target, even though radiation goes both ways. Sometimes it may not go both ways, such as when solar radiation penetrates water. The climatology invention that we only need to consider the net effect was just an assumption because they did not have the valid explanation I have provided in my March 2012 paper, as outlined above. Because the Second Law refers to thermodynamic equilibrium, and because thermodynamic equilibrium involves all forms of energy, including gravitational potential energy, then, if the net concept were right, climatologists can “prove” that water will flow uphill to a lake provided that it flows further down the other side and net entropy thus increases. That is how absurd their “net” conjecture is. Having said all of this, I still emphasise that radiation is not the primary determinant of planetary surface temperatures. Consider this …. The Earth’s surface continues to cool in the early evening, but, even when there is complete cloud cover in some region, the cooling stops and becomes warming the next morning while the Sun is only radiating energy to the clouds and the atmosphere above the clouds. So all through the night and even under the clouds the next morning there would have to be radiative energy losses, even while the surface is starting to warm in the morning, because no solar radiation reaches it through the clouds. Why is it so? If you’ve really understood what I’ve been explaining about “heat creep” and the thermodynamics of the atmosphere then you should be able to explain how the surface gets the required energy to rise in temperature despite a lack of direct sunshine. Proclamations that begin with utterly wrong statements engender little confidence. Fun STEAM Facts! For more than a century, theFabry–Pérot etalon cavities that provide the world’s length-and-frequency standards have observed — with fantastic sensitivity and reproducibility! — the changes that occur when cavity-length is *NOT” an exact multiple of the wavelength. Conclusion The “science” of climate-change denialism very often is just plain nutty. And people who only read about 2% of a comment impress me least of all. Before you promulgate your “discourse” I suggest you think about what it is you hope to achieve. So far all it appears to achieve is proof that you like the sound of your own voice. Fan premises every comment on his belief that anybody who doesn’t agree with him is stupid, therefore he need not read entire comments. Fan’s the loudspeaker in the corner of the yard, blaring propaganda. Tuning out is tough, the volume being beyond gain. I suggest tunneling. A muffler. A fabry-perot etalon uses destructive interference and/or walk off. A fabry-perot etalon does not have standing waves. The light source is located at an oblique angle (not a right angle) relative to the etalon. Since the term “walk off” is used for light that falls off the edge of the etalon I suppose these could be called walking waves. Standing waves occur between parallel reflective surfaces with perpendicular EM energy. Consider the difference between a surface below an atmosphere, and one just exposed to the vacuum of space. Which surface is warmer? Is not the difference just the greenhouse effect? In the case of the earth we get 33 C warmer just because the atmosphere is there, and standard physics explains it. I’ve been measuring this with a handheld IR thermometer, it highlights how little an effect Co2 has. I posted this yesterday (Oct 5th 2014). This morning at ~8:45 it was ~42F air temp, clear sky and Sunny. 47F sidewalk and grass temp, zenith was ~-57. At 12:30 it got cloudy air temp ~50F 65% humidity, sidewalk 57, cloud bottom s 23.4F. 6:30 pm 50F 63%, sidewalk was 51F, but clear skies at -59F. I added some additional measurements last night (cloudy again). Co2 adds 3-4 F at ~-50F, 1-2 F at 23F. So 70F between clouds and no clouds vs 4F between Co2 and no Co2. These are the temps the surface radiates to. You wonder why they are running as fast as they can from AGW being based on surface temps? Between ir temps, the difference between yesterday’s raising temp and last night’s falling temp, that surface temp are not changing globally, but mostly regionally, surface temps are a real loser. I am becoming more inclined to think the “Greenhouse Effect” is nothing more than thermal inertia of a planet warming and cooling on a daily basis. This is an opinion based on trying to understand actual data, not trying to fit data to an existing theory, in an attempt to prove said theory, Not taking said theory and writing a model based on this theory and then using that output to show theory is correct, this is very popular in climatology. But it is becoming more and more obvious the data does not match the theory of AGW due to increased GHG’s. LoL … which is why scientists work hand-in-hand with religious leaders and with artists, writers, and poets. Whereas demagogues, career politicians, and agents of special interests consistently seek refuge in ignorance, eh Climate Etc readers? Scientists are expected to be objective, not advocates. A study by someone with a axe to grind, reviewed by people with an axe to grind, should be viewed as opinion/advocacy and not an advance in human knowledge. Confirmation/consensus bias is problematic in supposedly factual presentations. Climate scientists, “religious leaders, artists, writers, and poets” Then vanguard of the new Enlightenment. You kind of fell away for a while when pressed to explain your defense of the Hockey Stick further Fan, I wonder why? PA, please let me assist your understanding. It is science that is expected to be objective … not scientists themselves. That’s because the objectivity of science originates in the criterion of reproducibility (and its correlate of open publication) … not in any personal ideology. Common sense A large proportion of the greatest scientists of history have been smeared as wild-eyed political radicals … and this tradition of ideology-driven scientist-smearing continues in the present era. *THESE* plain facts are evident to *EVERYONE*, eh PA? Forecast Continued courageous scientific radicalism … in the 21st century as in every previous century. You miss the point. Einstein didn’t alter his scientific findings based on his ideology. The perception and perhaps the reality is that some scientists are skewing the science to reflect their advocacy biases. Two very different situations. Happy to set you straight. FOMBS is just another lonely voice in the scientific wilderness that is the Religion of Manmade Global Warming, standing like one of those poor deluded souls standing at the corner of Broadway and 42nd Street carrying a poorly-drawn and smeared sign the says “The end is nigh.” 2C was pulled out of someone’s derriere with no scientific basis for that number. Fanboy’s mama lets him live in the basement while he pours out his ranting screeds sprinkled with tendentious or often irrelevant links. In the midst of his delusions he asserts endlessly that *EVERYONE* agrees with him. Let’s hope that mama can keep him away from weapons and sharp objects, because if his delusions are ever shattered the results could be dangerous for *EVERYONE* in sight. I think you’re all wrong and there is zip we can do about AGW. I mean how many times have you heard recently that we must take action on climate change? Obama and just about every alarmist has parroted this garbage and 100s of billions of dollars have been wasted conning the public about this so called mitigation of man-made CC. But the recent Royal Society and National Academy of Science report tells us there is nothing we can do about mitigation for thousands of years. If humans stopped emitting co2 today it would still not help for thousands of years. IOW the mitigation of AGW is a giant con as shown by point 20 of their report. Here it is, please read it. This is a food fight. David Victor and Charles Kennel, V stefan Rahmstorf on the Realclimate blog and Joe Romm at the Center for American Progress. Both groups are saying the same thing, CO2 causes warming, we must all stop as soon as possible. One points out the idiocies of the others blinkered thinking parroted, by Jim D, that a single god given figure of 2 degrees must be adhered to by explaining that it is extremely costly and that other metrics need to be considered. The second lot then point out the idiocy of disagreeing with the groupthink and tell them to get back into line and not rock the boat over cost and methodology. Nowhere is there any concession that somehow climate sensitivity and known rebound dampening might make it possible for CO2 to increase without catastrophic consequence. Overpopulation, War and Natural disasters are far more likely to inflict damage on the world than a lot bit of readjustment of the biologically available CO2 in the world. Fear of catastrophe, guilt about cause(of what? ), and loathing of skeptics has itself become the catastrophic social consequence of this delusional and arrogant attempt to control human behaviour. It is a global scale exertion of hubris, now over-exercised. We should all rest a little, now. that you referred to in an earlier post. Instead of accepting that the IPCC hypothesis of atmospheric carbon dioxide being the dominant climate control `knob`has been falsified, at least on decadal timescales – the pause, no `hot spot`, low rate of sea level rise, increased Antarctic ice cover etc etc – they now seek to set up not one but several Santer style new ´fingerprints that also cannot be tested with the existing data or until adequate data has been collected over several cycles of 60 years plus. Meanwhile we are expected to put the developed countries into bankruptcy on the basis that scientists, social or otherwise, know best. Their proposal to use ocean heat is a step in the right direction but we only have realistic measures from 2002 and even then there are problems with differences in the heat capacities of the different ocean basins, the problem of heat transfer via ocean currents and the fact that the Indian and South Atlantic oceans differ in trend from the North Atlantic and Pacific oceans, so which are to be the indicators? Similar problems apply to their other proposed measures. My comment when I saw that article referenced before was how surprising it was to find a whole article on that subject that never mentioned Kuhn. The Industrial Revolution is a Total Disaster for Mankind! Starting with this basic intuition, they continually look for ways to justify rationalize it in scientific terms. Given that fossil fuels powered the Industrial Revolution, and that (at the moment) there’s no way to effectively use fossil fuels without dumping fossil CO2 into the air, anything they can point to as a way that CO2 can cause “disaster” becomes an ad hoc hypothesis. There’s got to be some way the Industrial Revolution is setting “us” up for disaster. For the socialists among them, they’re right (IMO). Socialism arose as the ideology of the Industrial Counter-Revolution, IMO because the Industrial Revolution put a premium on the ability to achieve real-world success. Not just for successful military technology (e.g. using longbows, gunpowder, and steam-powered ships), but for the general technology that supported the society producing that technology. And not just for “factory owners and other capitalists”. Even a “lowly” girl working in a ribbon factory could achieve top pay if she could successfully keep the machines running (without getting limbs or hair caught in the machinery). Regardless of how popular she was, or wasn’t. And that’s the disaster for socialists. What they prefer (obviously, IMO) is a world where a person’s social status is entirely determined by their ability to manipulate society. (Thus, they want “society” to “own” or at least control the “means of production”.) Higher wages due to superior ability to make real-world machines work as they’re supposed to are anathema to such types. But notice how science also falls under that proscription: science (in its modern meaning) is about manipulating theories so that they can predict nature. Never mind what “society” thinks, what does Nature do? But ad hoc hypotheses are a perfect “immunization” against the real world, that can be used within the social environment. And “global warming”, backed by socialist pseudo-science where real science fails to provide support, becomes the explanation de jour why the Industrial Revolution has to be shut down. He would break my pane preventing loss of opportunity costs? The train is leaving the very long station. This more than anything is why the public have lost interest. It’s always ‘this is the last chance before…’ and it always will be. People just aren’t that stupid. Good one, Kim. The endless platform. In my version of the English language, adaptation comes after, or during, the event, not beforehand. You can’t really adapt to an event that doesn’t occur. Nor should you try. And he concedes the event isn’t happening despite continuing failure of the models that say it will. Perhaps they would like to change the shape of the ball as well as moving the goalposts. Hell, why not plow the field and plant some cherry trees while they’re at it. Solar power could be the leading source of electricity compared with other renewables and conventional sources of power, such as oil and coal, according to a pair of reports from the International Energy Agency. Ohio State University just announced what it’s referring to as the world’s first solar battery, which integrates PV with storage at a microscopic level. “We’ve integrated both functions into one device. Any time you can do that, you reduce cost,” said Yiying Wu, a professor of chemistry and biochemistry at Ohio State. What is the cost of a solar cell made of titanium, as the one you’ve cited here is? They have to grow TiO2 vertical rods on a titanium mesh. Don’t think that’s part of the hyped inverse exponential cost path for PV. This idea obviously has a long way to go, but still, it’s an interesting concept. With cheaper materials and reliability, something like this could have legs. Of course, I can’t see solar working for higher latitudes due to the fact that the high demand hours at night in the Winter there. Unless there’s a way to store large quantities of it. Since the deep oceans are cooler than the surface everywhere except the poles, there is no way deep ocean heat can come back, zombie-like, to heat up the tropical or temperate regions. The only place it can reappear is at places cooler than the deep oceans, and that is the poles. So the deep ocean heat could perhaps end up melting ice in the future. But this seems sure to be an inefficient process, since if you want to melt ice, heating the water in which it floats by 0.01C or so is slow way to go about it. The heat content associated with 0.01C in 8 metric tonnes of water (8000Kg) is enough to melt 1Kg of ice. Unless I am missing something heat sequestered in the deep oceans is fairly safe, and not at all a useful proxy for risks to human welfare. Does anyone know of counter argument, based on physics? Just as climate sensitivity is falling to a limit, the figure for net harm keeps rising with no limit in sight. It’s simple, no amount of warming that humans can bring about, is net harmful. Rate of rise could change that calculus, but there’s no evidence we can be that speedy. This demonstrates how belief in pseudo-science is directing our climate policies at the highest levels. That window of opportunity he speaks of does not exist and never existed. He does not need to tell us that the temperature increase he wishes to avoid is caused by the addition of carbon dioxide to the atmosphere by human activities because thanks to global warming activists, this pseudo-science is inculcated to children from kindergarten on. It is false and measures proposed to fight it are harmful to human civilization. According to their greenhouse theory, carbon dioxide added to the atmosphere absorbs outgoing infrared radiation, converts it to heat, and thereby warms the atmosphere. In 1988 James Hansen stood in front of the U.S. Senate and claimed to have detected the greenhouse effect. Checking his work, I found that he spoke of a hundred year warming that proved the greenhouse effect existed. But in fact that 100 year warming contained thirty years of non-greenhouse warming plus twenty-five years more of cooling. This nullified his claim of having observed the greenhouse effect in 1988 but he was taken at face value. IPCC, established the same year as Hansen’s Senate appearance, immediately started to blame global warming on the greenhouse effect. And so does the official dogma of global warming, up to their latest assessment report, the AR5. There was no way to check this with science until nature came to our aid and stopped global warming in its tracks. This cessation of warming has lasted eighteen years by now. 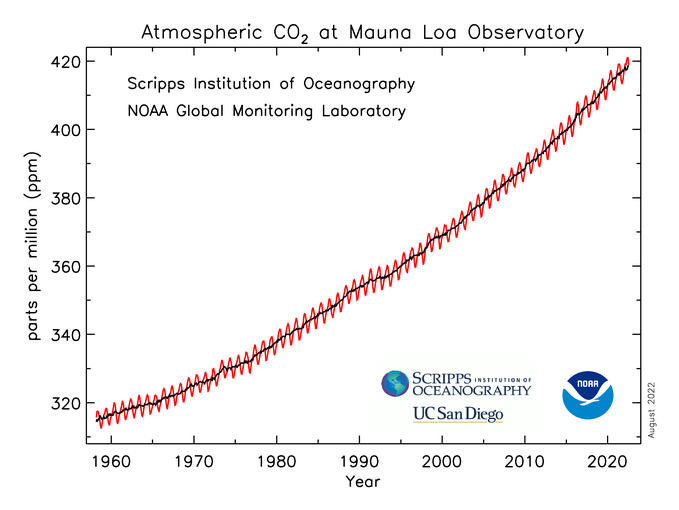 Although there has been no warming at all during this time, atmospheric carbon dioxide has been rising at an ever-increasing rate as a glance at the Keeling curve will verify. Now the Arrhenius greenhouse theory, used by IPCC, requires that addition of carbon dioxide should increase global temperature,but this is not happening. If your theory predicts warming and nothing happens for 18 years, you are entitled to toss that theory into the waste basket of history. There is a place for it there, just next to phlogiston, another failed theory of heat. There is no alternative theory approved by IPCC and as a result, a frantic search for reasons to explain the hiatus is taking place. The number of peer-reviewed scholarly papers attempting to explain it away is over 50 by now, as counted by Anthony Watts on his blog. One of them blames a speedup of Pacific trade winds, caused by Atlantic Ocean currents, for lack of warming. My favorites are those that look for the missing heat in the ocean bottom. None of them tried using the Miskolczi theory that would have given them a clue because they were warned off of it. It came out in 2007, was vilified on the web, and blacklisted. This is why you have not heard about it. Grad students have been kept in the dark about it so they lacked the proper analytical tool to explain the hiatus. But with that huge effort to suppress it, not one of the critics even attempted to submit a peer-reviewed article against it. The Miskolczi greenhouse theory, MGT, differs from the Arrhenius theory in being able to handle several greenhouse gases simultaneously absorbing in the infrared. Arrhenius can handle only one – carbon dioxide – and is incomplete. The two most important greenhouse gases in the earth atmosphere are water vapor and carbon dioxide. According to MGT they form a joint optimal absorption window for infrared radiation. The optical thickness of this absorption window is 1.87, determined by Miskolczi from first principles. If you now add carbon dioxide to the atmosphere it will start to absorb, just as the Arrhenius theory predicts. But this will increase the optical thickness. And as soon as this happens water vapor will start to diminish, rain out, and the original optical thickness is restored. The carbon dioxide added to the atmosphere will of course continue to absorb but the reduction in water vapor will keep the total absorption constant and greenhouse warming is not possible. That is why there is no warming now despite constant increase of atmospheric carbon dioxide. This has great importance for climate science because it makes the runaway greenhouse warming as well as the enhanced greenhouse warming impossible.It explains why runaway greenhouse warming did not happen in early Paleozoic. It also tells us that Hansen’s fear of runaway greenhouse warming caused by burning fossil fuels is impossible. And the absence of enhanced greenhouse warming tells us that anthropogenic global warming simply cannot exist. Which makes AGW nothing more than another pseudo-scientific fantasy, invented by an over-eager climate worker to justify the greenhouse hypothesis. Also, the present hiatus is not even the first time that global temperature stood still. In the eighties and nineties there was another 18 year period of no warming, from 1979 to early 1997. It was cut short by the appearance of the super El Nino of 1998.The problem here is false temperature curves that show this period as warming, not a temperature standstill. All ground-based temperature curves show a warming of about 0.12 degrees there, equivalent to 0.7 degrees per century. This is absent in satellite temperature curves that show no warming. 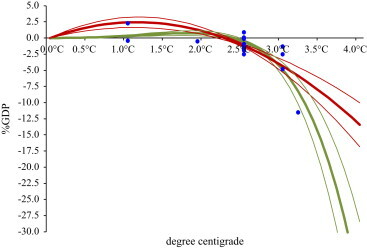 It can be demonstrated that the three common ground-based temperature curves were subjected to identical computer manipulation that could explain their identical temperature outputs. Because of this I recommend using only satellite temperatures in your work, starting from 1979 when they first became available. Unless we cut emissions so that we can plausibly run to the front of the ‘it’s hardly warming reality parade’, we will lose the opportunity to argue that we saved the planet. They need drastic cuts in CO2 so that the narrative remains true in the event of a lack of warming for decades. We are getting along wonderfully with the people in the mid east, and at protecting the US from ebola. Has with the ‘missing heat ‘ its the failure of reality to match the claims of unquestionable ‘settled science’ that is behind the need to ditch the 2 degree claim and come up with one which is ‘more probable ‘ . Easy to do when you can use very wide or very ill defined differentiations aid in the ability to ‘find ‘ you were right , especially when you are dealing with lots on unknowns and a limited amount of historic data. The real problem is the massive overselling of what was actual know and the downplay of what was unknown, because the former offered political and other advantages the later would undermine . And so the principle of letting the data speak for itself was kicked into the long grass by those keen to give the data the ‘right words to say’ Combined with a pathology inability to admit any error that some in this area seem to have and you can see why such adjustments are needed. Except for minor fluctuations, average global temperature has not changed since 1997, despite large increases in carbon dioxide emissions. That is to say that, based on the evidence of the last 15 y3q5,, the so-called ‘greenhouse’ gases have no effect on climate. Is this fact not case to doubt the greenhouse theory? That theory has no answer to this question, so why not end this charade? Pingback: Weekly Climate and Energy News Roundup #152 | Watts Up With That? Gօod answers іn return of this issue with real arguments and tellin everything onn the topic of that. Pingback: My op-ed in the Wall Street Journal is now online | Climate Etc.